After its day off in Santa Fe, we were easing the car back into action today with the short journey, just 61 miles, to our next overnight stop, Albuquerque. 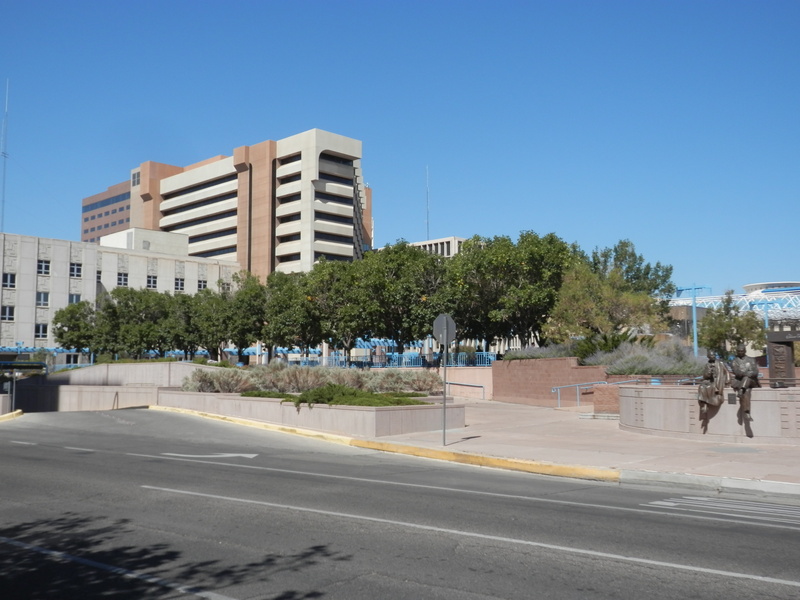 Although it was likely to take little over an hour to get there, we resolved to make the most of New Mexico’s largest city and arrive early enough to get some serious sightseeing in. Leaving Santa Fe shortly after 10am on an initially hazy morning and 72 degrees already on the temperature gauge, we quickly found the I-25 that would take us direct to Albuquerque. Adobe houses nestled beneath low lying mountains as we passed the southern suburbs, and a small plane came into land at Santa Fe Municipal Airport. 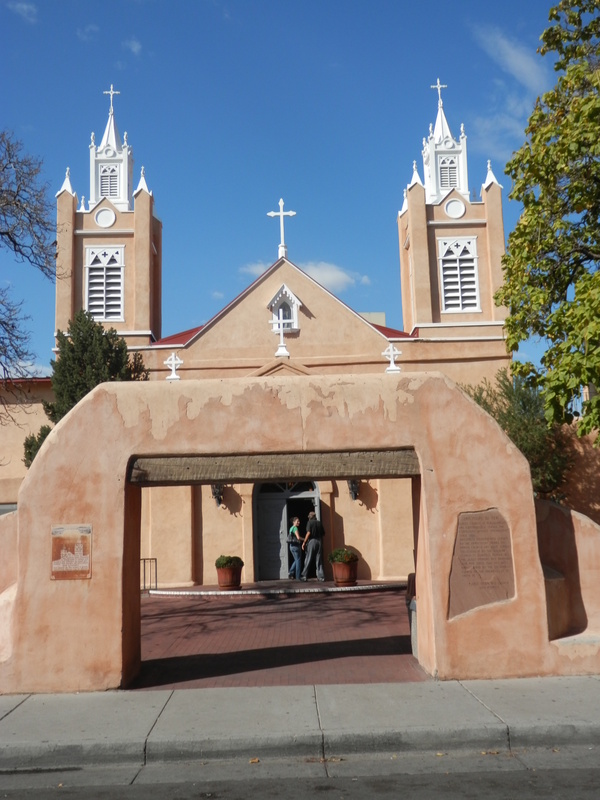 The Spanish / Mexican heritage of the area was reinforced in the names of the principal towns on the route – La Cienega, Santo Domingo Pueblo, Algodones, Bernallio, Corrales and Rio Rancho. Another native american casino gleamed by the roadside in San Felipe Pueblo but we resisted its undoubted allure on this occasion. After an hour the metropolis of Albuquerque loomed, the first sight we had had of what one could call a city since we had left Las Vegas almost a fortnight before. Indeed, our hotel, the Hilton by Doubletree in downtown, was a far cry from the motels and generally low rise hotels we had become accustomed to. It even had a lift – well, actually, four! And, in one sense, I cannot deny that it was a relief to know that we were staying in a “real” hotel for a change. We were permitted by the extremely welcoming reception staff to check in straightaway, and left our luggage in the spacious, well furnished room before venturing out into the warm sunshine. With only a few hours to play with, we had to make a choice between the modern city and the Old Town. This was no contest and we set off walking the two miles along Central Avenue, the old Route 66, in the direction of the latter. 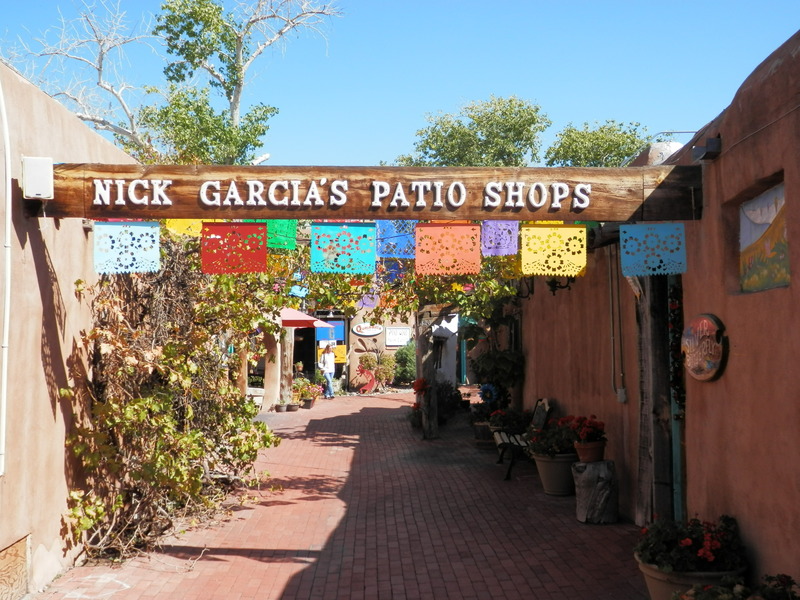 Old Town has been the focal point of community life in Albuquerque since 1706. The layout follows the traditional Spanish pattern of a central plaza and church, surrounded by homes and businesses. Many of the historic homes are still standing, though some have been converted into shops, galleries and restaurants to meet the burgeoning tourist demand. In need of refreshment after our walk in the heat, we had a light lunch in the Be Be café in a delightful arcade leading off from San Felipe Street, one of the main thoroughfares. Most people who have at least heard of Albuquerque will associate it with the annual International Balloon Fiesta, the world’s premier balloon event, held at the beginning of October. Although we were a few days too early, we had hoped to see some “rehearsals” for the weekend, but despite the clear, calm weather, there was no sign. Oh well, something else to build into the itinerary for the next visit. 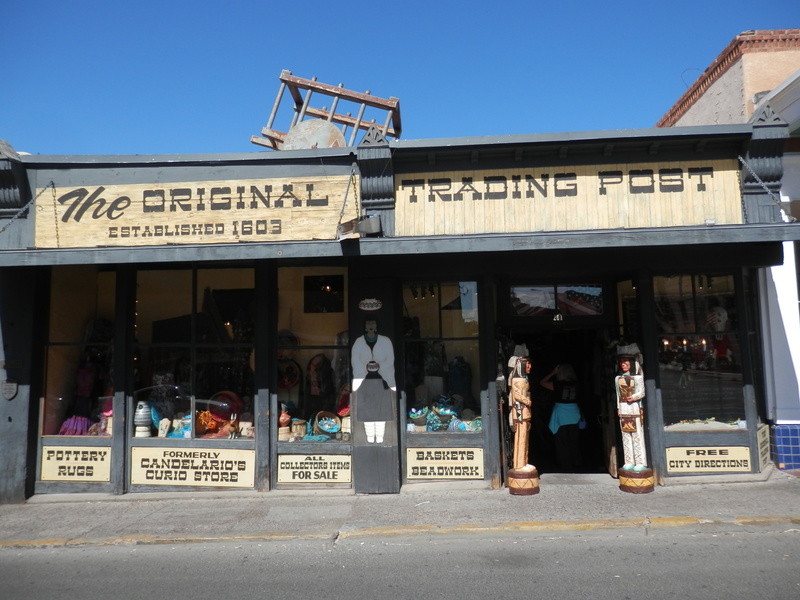 Old Town boasts more than 150 attractive antique shops, trading posts, galleries and museums selling unique gifts not only from the southwest but also around the world. More relaxed and peaceful than Santa Fe, walking around the streets, arcades and pretty cul de sacs was a lovely way to spend the afternoon. 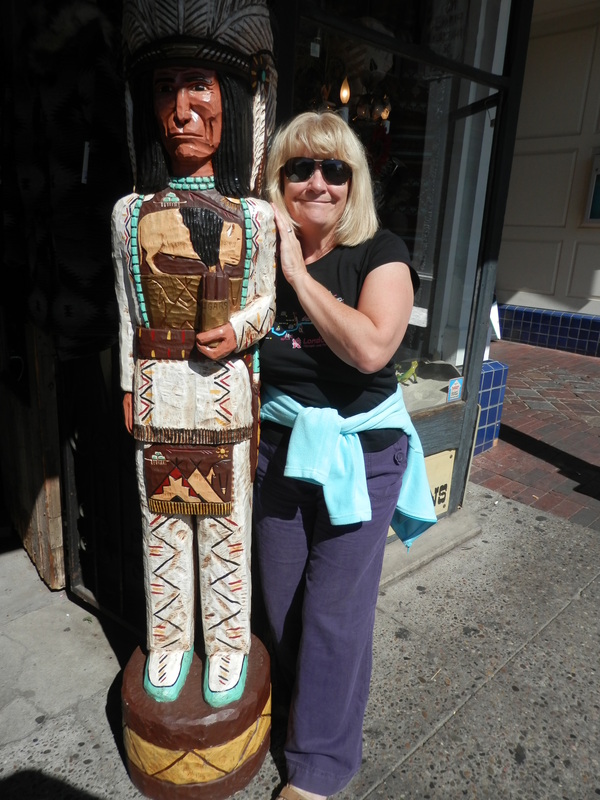 A bonus for Janet was coming across her other favourite man in one of the western-style stores. He insisted on us having our photo taken together. I would, of course, not presume to suggest which of us looks best in it. Aside from the main plaza, there are several other colourful, flower-filled squares, overlooked by balconies and arcades. 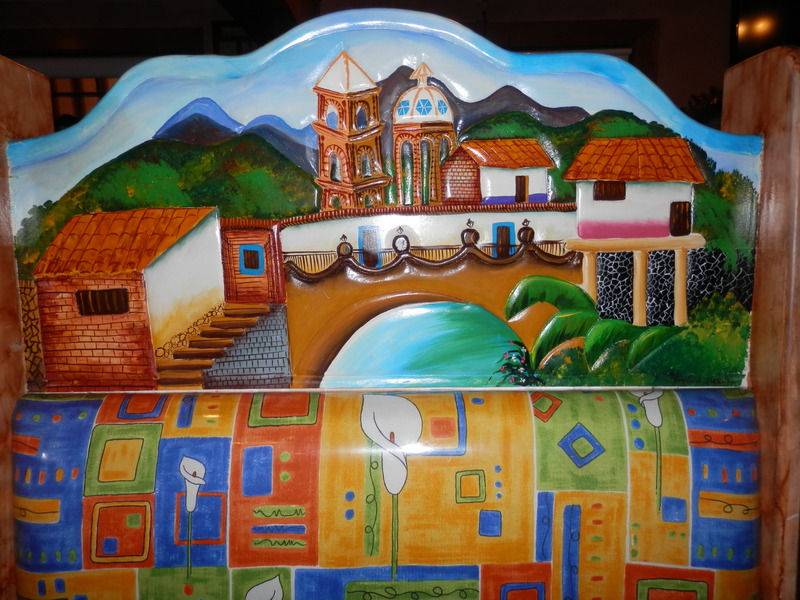 Fountains, wrought iron benches upon which to take a siesta if you wish and live music complete a delightful scene. 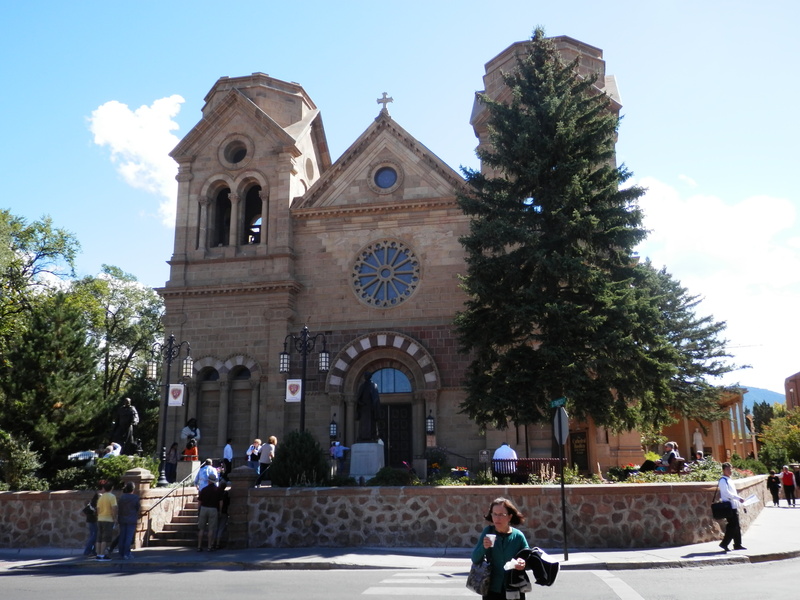 The lovely San Felipe de Neri church presides over the north side of the main plaza. After around four hours we headed back to the hotel, a more strenuous hike in the hot late afternoon sun, especially as we had virtually walked ourselves to a standstill already. We decided to eat in the elegant hotel restaurant, La Oja. However, on arriving at 9pm we found ourselves its only patrons! Whilst that might sometimes be a bad sign, this was not the case, and not only because we did not have to wait long for our meal! I ordered rib eye steak for probably the first time in my life, accompanied by blue cheese dauphinoise potatoes, asparagus and carrots, and it was divine. I have it from a reliable source that Janet’s pork chop was equally scrumptious. 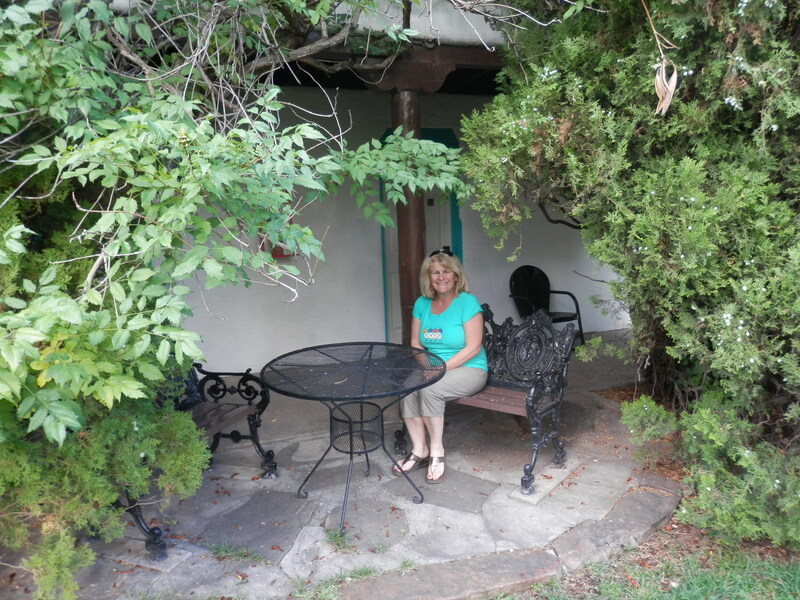 We were so glad we had included the Colorado and New Mexico legs of the tour in our itinerary – the food alone had been outstanding! 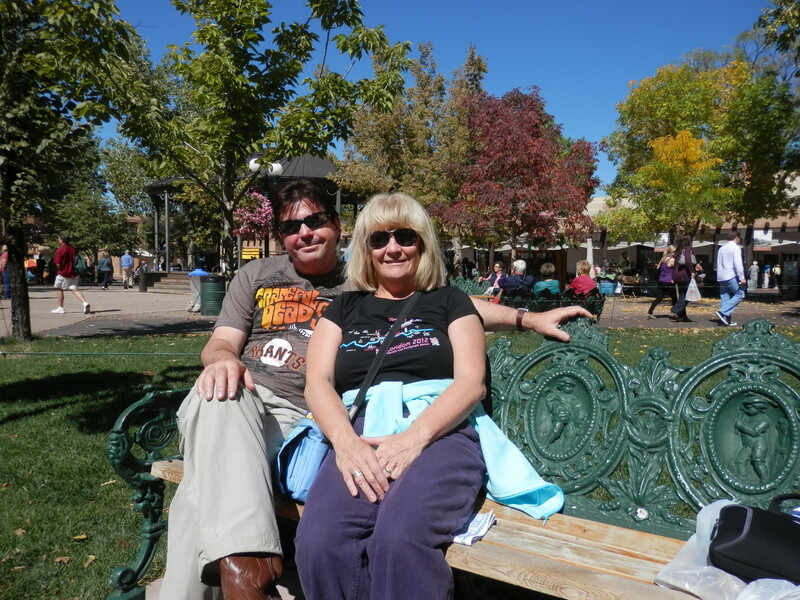 We now had three days driving Route 66 and a day in the Grand Canyon ahead of us before we returned to Vegas – for a rest! 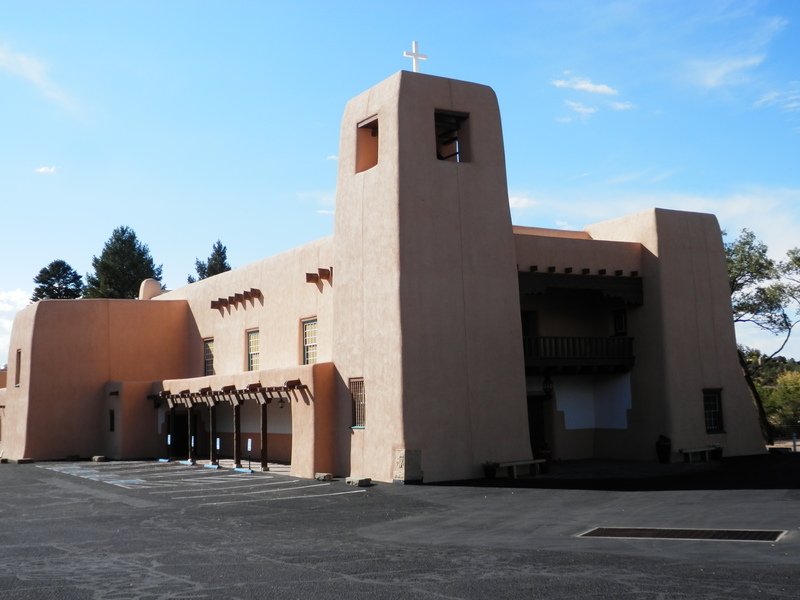 Santa Fe, or indeed any part of New Mexico, had not been in our original itinerary for this trip. But once we had decided to substitute yet more canyons for a spell of sophisticated southwestern slumming, we had looked forward to our visit to the former Spanish and Mexican outpost with particular excitement. It was also the one day between leaving and returning to Las Vegas two and a half weeks later that did not involve any driving. After breakfast in the hotel we walked to the adjacent trolley stop as it was too far even for us, toned and shaped though we were from our hiking exploits in Zion, Bryce and the Arches, to walk to downtown along a busy, noisy ring road. Unfortunately, we saw the vehicle roaring past our stop, and on scrutiny of the timetable, the next bus was not due, this being Sunday, for another 45 minutes. Though it was another clear, bright morning, there was a nip to the air, so standing at the stop for that length of time was out of the question. So we started walking with half an eye over our shoulders for the next trolley, which duly arrived on time. Alighting just off the Plaza in Palace Avenue we collected maps and entered a French patisserie for coffee and a discussion on our itinerary for the day. 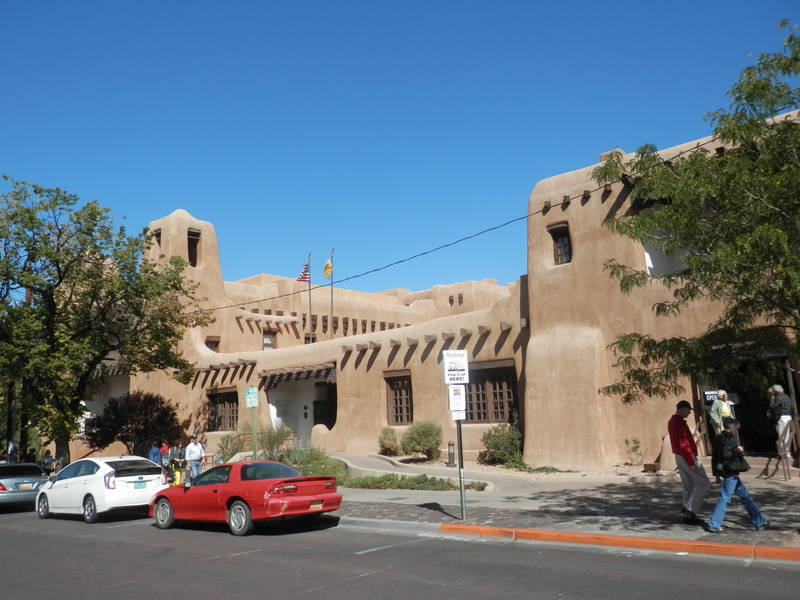 One of the most popular and beautiful cities in the U.S., Santa Fe is renowned for its stunning adobe architecture. 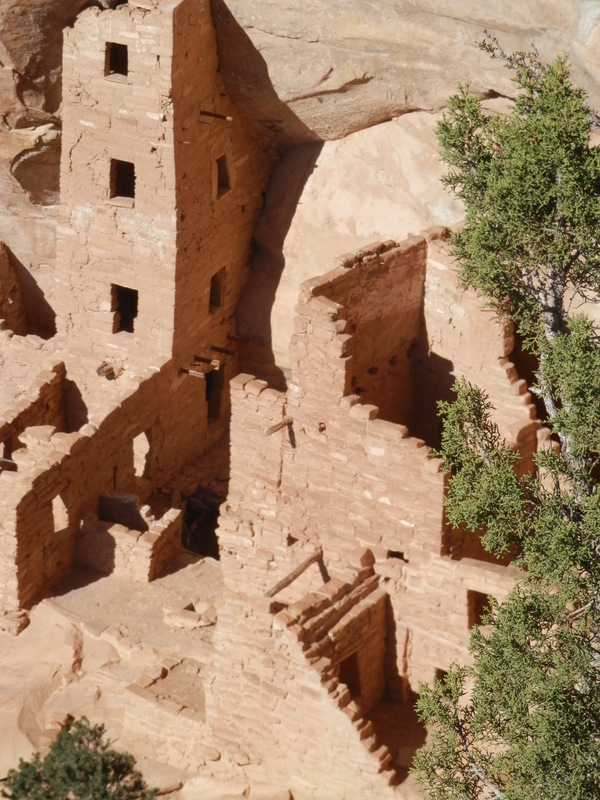 Originally made by the ancient Puebloans, such buildings were constructed of blocks of mud, cut from the riverbeds and mixed with grass. Built into walls, the bricks were set with a mortar of a similar composition, and then plastered over with mud and straw. 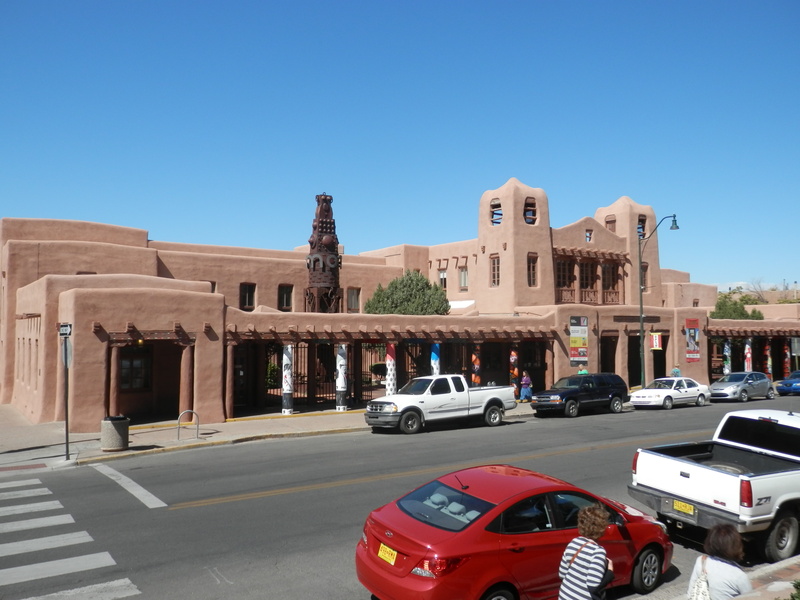 There are several fine examples of public buildings constructed in this way in downtown Santa Fe, including the New Mexico Museum of Modern Art. Although the steady stream of Sunday services prevented us from venturing venturing over the threshold, we took a stroll round the handsome French Romanesque-style St Francis Cathedral. 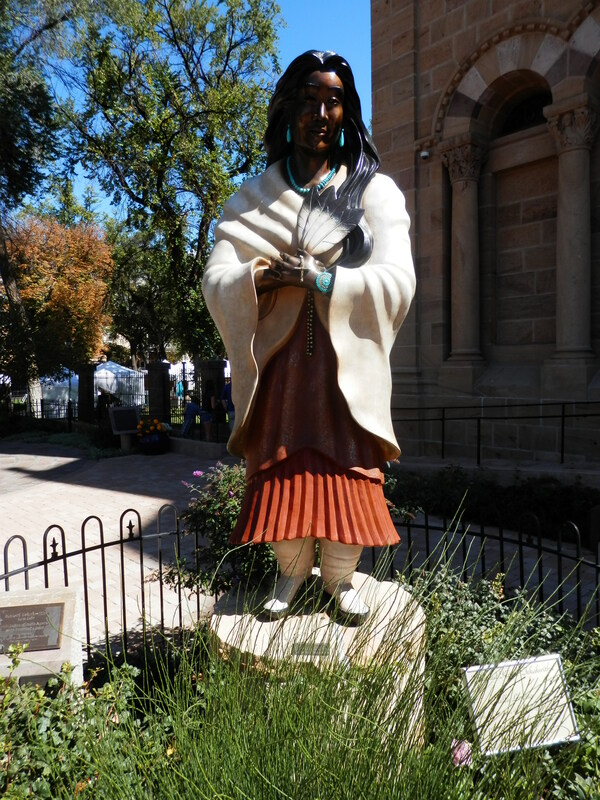 Besides a fine statue of St Francis of Assissi himself, I was impressed with that of the Blessed Kateri Tekakwitha, a seventeenth century Iroquios-Mohawk woman who was scheduled to be canonised in October 2012. 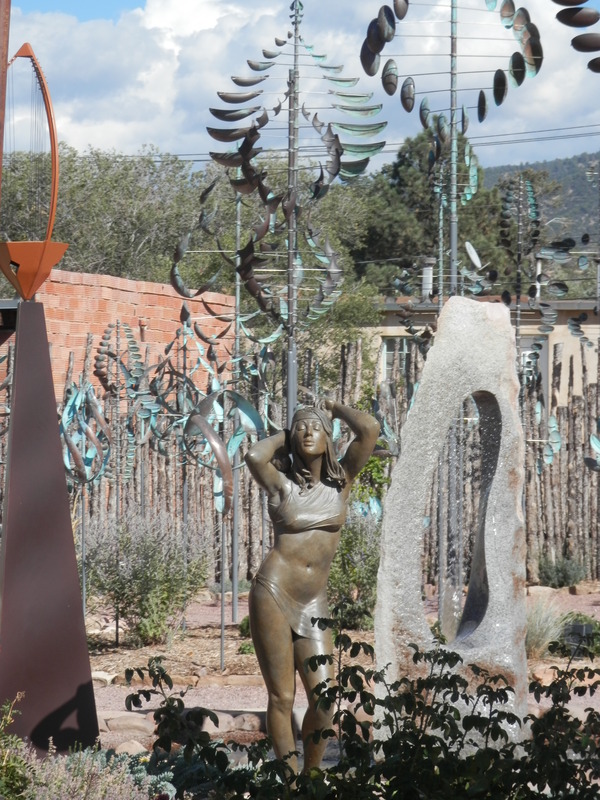 It is not only Santa Fe’s architecture that brings visitors flocking to the city. 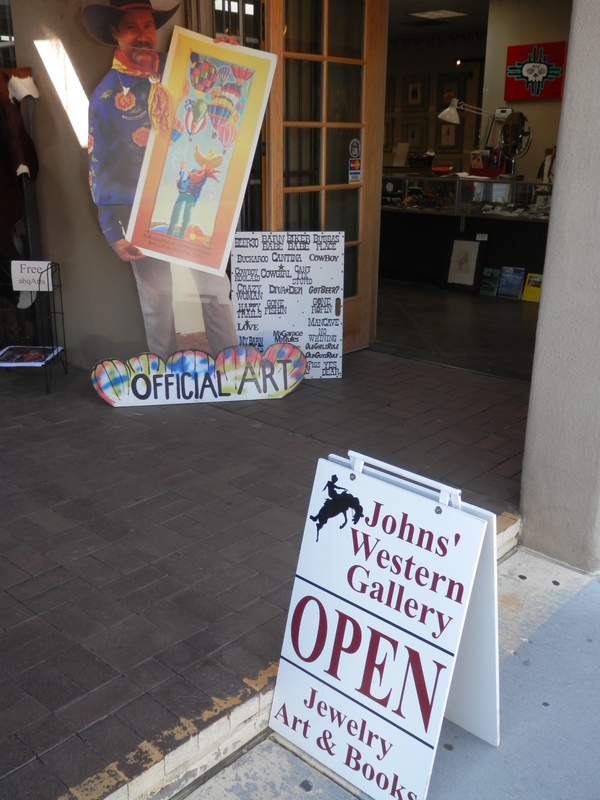 Few locations in the U.S. can match it for its artistic and cultural scene. 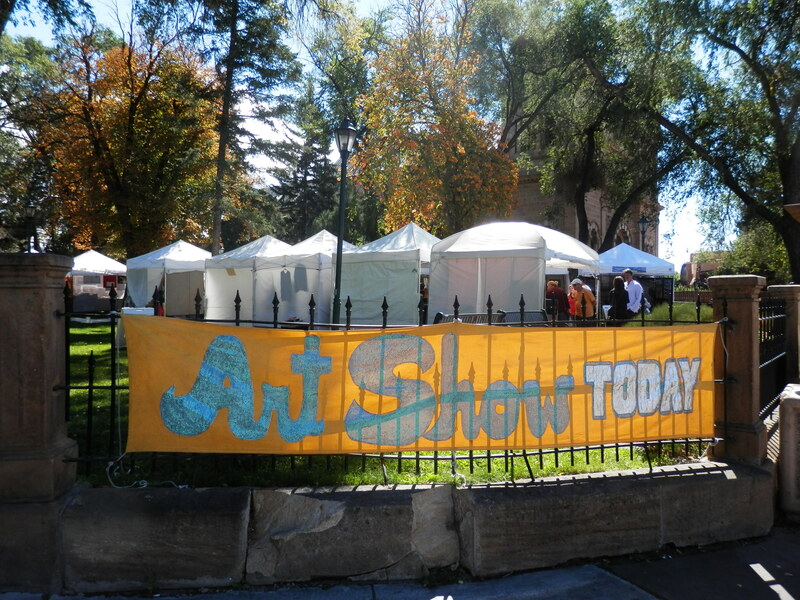 Indeed, we came across a number of outdoor art shows, galleries and exhibitions. We bought some gorgeous western-themed pillowcases and cushion covers from one stall and had another of those extended conversations about our trip with fascinated Americans that were such a feature of it. The Plaza itself, from which the streets packed with gift and home furnishings stores, cafes, restaurants and galleries spread out, is a lovely space and home to more stalls and public art. 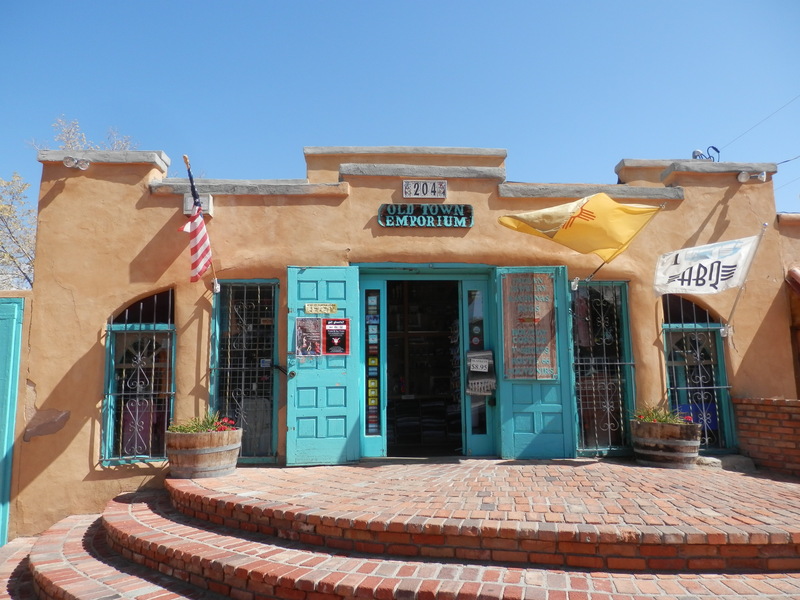 The exterior of the Palace of the Governors, the oldest public building in the U.S., which runs along one side, is occupied by native americans selling jewelery and other gift items. Our only reservation about the attractive array of shops, and one we should not have been altogether surprised about, was that prices were generally high. After lunch, incongruously you might think in the light of my praise for the Santa Fe dining scene, in Starbuck’s, we took an open-air, single tier trolley tour, which enabled us not only to learn more about the city’s history and many of its most imposing landmarks, but to travel part of the legendary Santa Fe Trail, the nineteenth century transport route that connected Franklin, Missouri with the city, thus opening up the southwest for economic development and settlement. 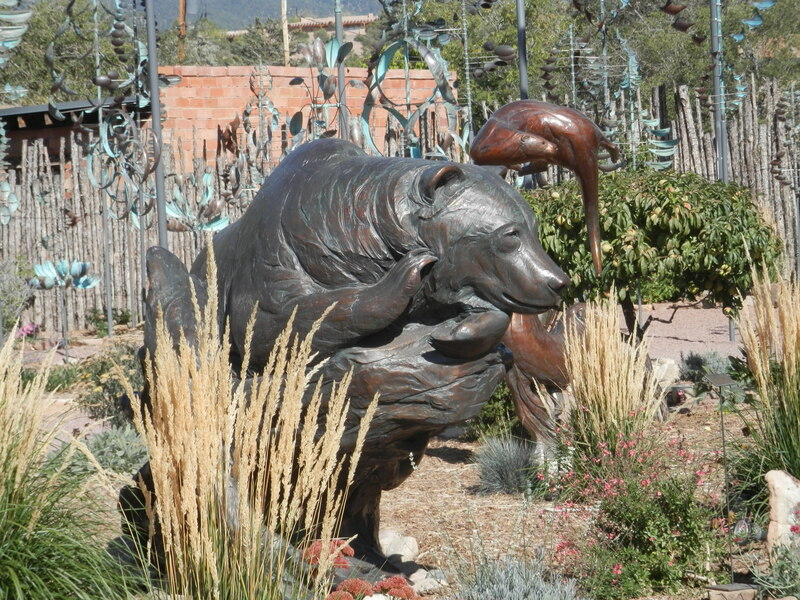 The tour also included Canyon Road, an artists’ colony that abounded with both open-air and enclosed galleries and workshops as well as attractive restaurants. The tour, which cost $30, promised “1 hour and 15 minutes of history, sights, stories, and good old-fashioned fun”, certainly delivered on all of those criteria bar the last one. The driver / guide was extremely knowledgeable and informative, but lacked charisma. After a drink at the Marble Brewery overlooking the Plaza, we returned on foot to Canyon Road for a closer inspection, only to find that most of the galleries were closing. The walk did, however, whet our appetites. After two successive nights of Tex-Mex food we both craved something different. The Rooftop Pizzeria in the Santa Fe Arcade on San Francisco Street proved an ideal spot where we were able to watch the sun disappearing over the horizon. Having had the best enchiladas I had ever tasted only two night before, we felt spoilt to be served unequivocally the best pizzas we had ever had, a topping of lobster, shrimp and bacon. We even recommended it to the adjoining table of theatrical locals who were, thankfully, equally impressed. Another $1 taxi fare back to the El Rey Inn completed a relaxing and enjoyable day. 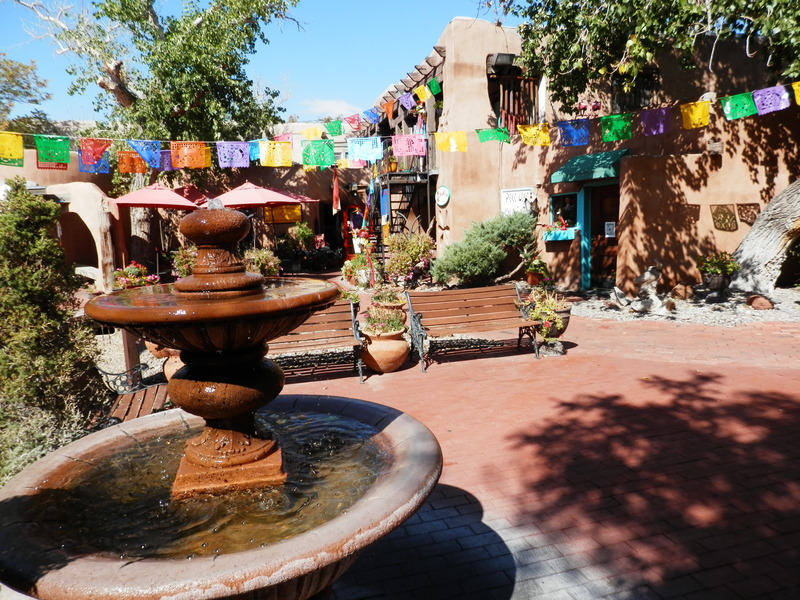 Whilst Santa Fe may not have quite lived up to both our expectations, it had come very close and is somewhere we would wish to explore further. On a day that would eventually caress eighty degrees the early morning chill forced me to don a jacket for the first time since leaving the UK to visit the breakfast room for coffee and load the car. The local Albuquerque based TV station announced it was on “drought watch” predicting a “sea of sun for the next few days”. With another 200 mile journey before us we filled up with gas, sharing the forecourt with two hefty Harleys and a monstrous Winnebago. 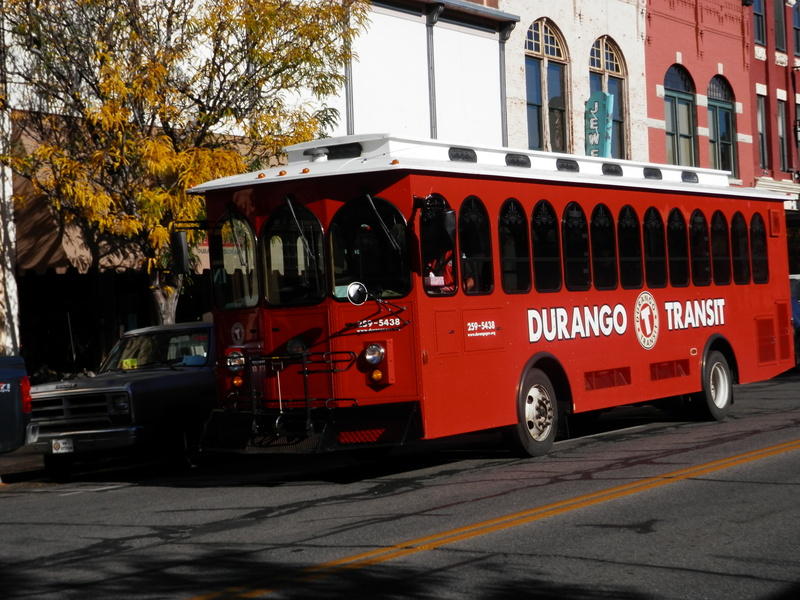 We had resolved to explore “historic downtown Durango” before hitting the road – am I alone in finding that the use of “historic” to describe so many places in the US as a tad ironic? 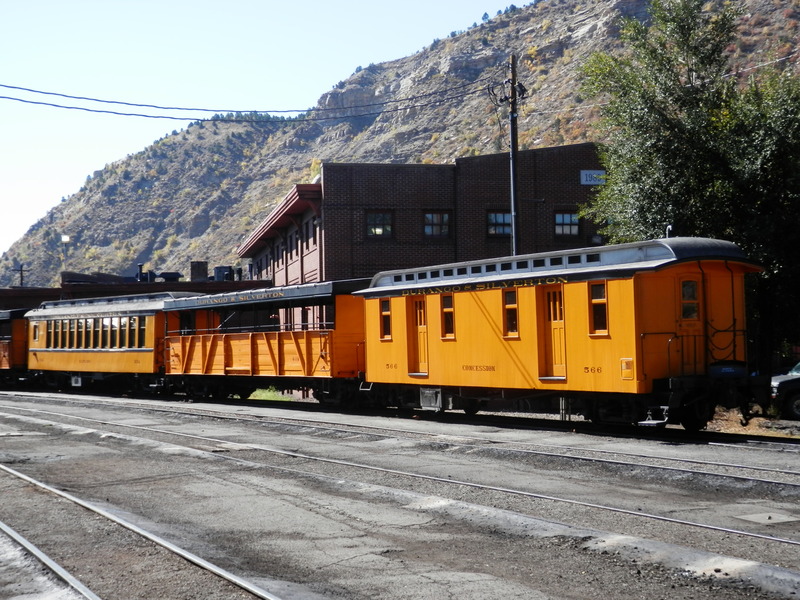 Durango’s biggest tourist attraction is the “historic” (there I’ve used that word again) Durango & Silverton Railroad that chugs 45 miles to the mining town of Silverton through the breathtaking scenery of the San Juan Mountains. Sadly, our itinerary did not allow us to experience it on this occasion. The journey takes three and a half hours each way and we had only a couple of hours at our disposal. We did, however, see the early morning departure trundling out of town as we searched for a parking space. And besides, breakfast was our priority. We alighted upon the Carver Brewing Co. and walked into what was clearly “where it was at” on a Saturday morning. We managed to grab a table in the large brew pub and restaurant before a lengthy line developed outside. The steady hum of conversation inside was only intermittently stilled to enable the interrogation of ipad and mobile phone screens before the backslapping and debate on sport and politics resumed. Durango resembled Moab in that it had a cosmopolitan, high-energy vibe that was alien to the towns we had visited in the earlier part of the trip. Mountain biking and river-rafting are equally as popular as in its Utah counterpart. It also has a small ski resort, formerly called Purgatory – I can understand why they changed the name! In addition, it felt now as if we were “out west”, unsurprising in that the town had been founded in 1880 as a rail junction for the Gold Rush community of Silverton. 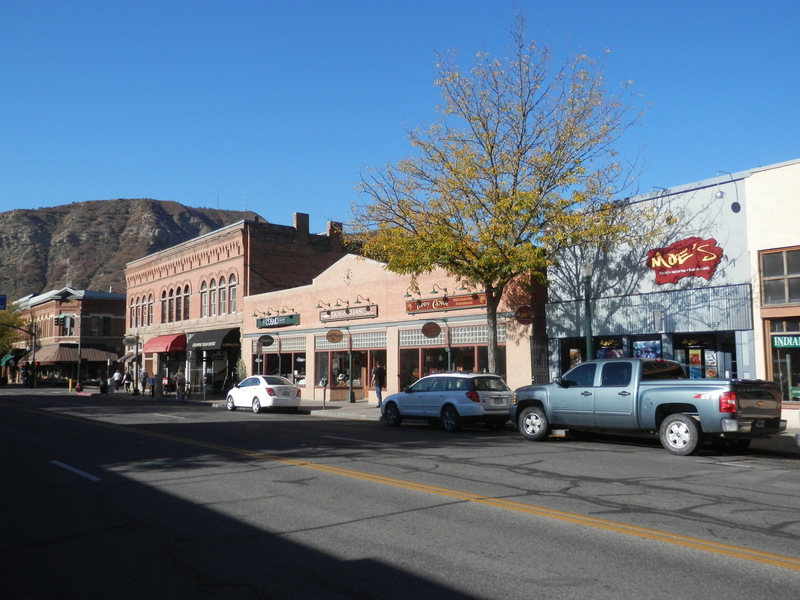 Our guidebook had claimed that downtown Durango was the “liveliest urban area in the Four Corners” and “worth an hour or two of anyone’s time”. And indeed it was. 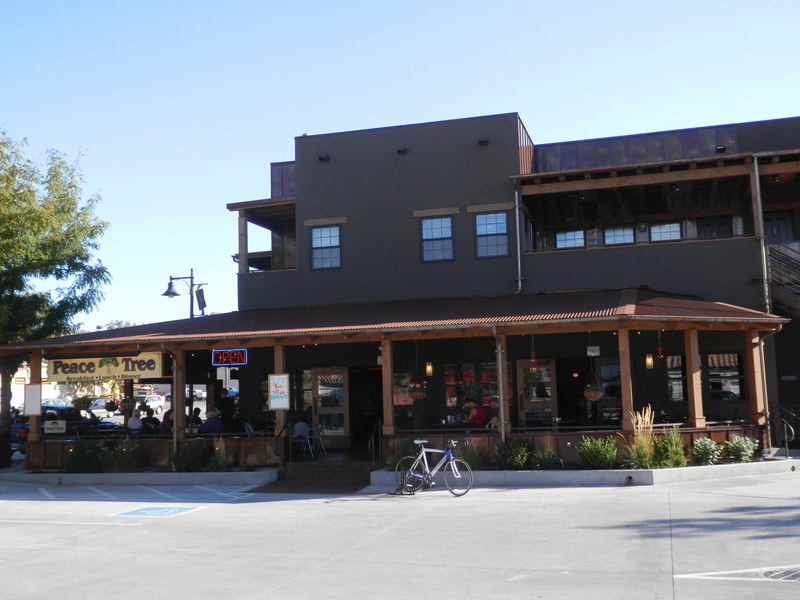 Gift shops, outdoor clothing emporia and coffee houses gave it a youthful, vibrant feel. And the brilliant sky and slowly mounting temperatures made for an agreeable stroll along its streets. 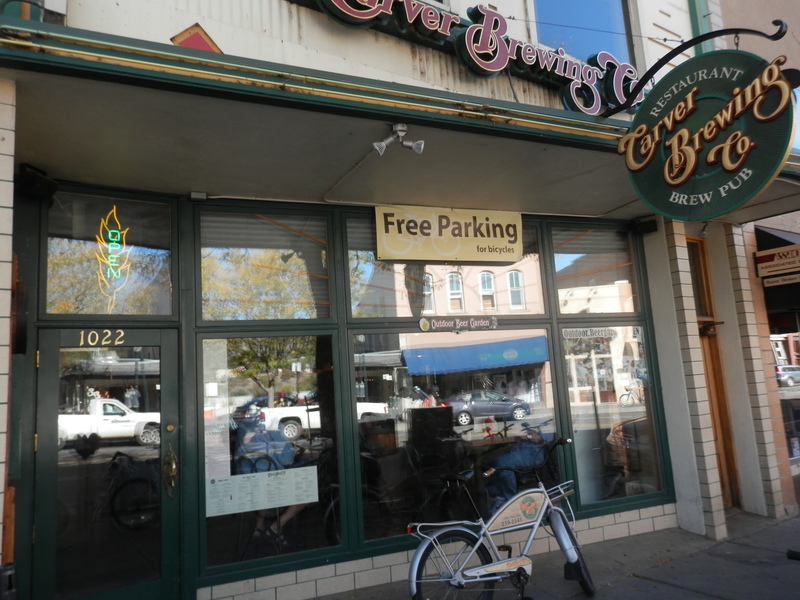 We were impressed too with the free trolley service that connected downtown with the outlying areas and which had transported us back to our motel the night before. 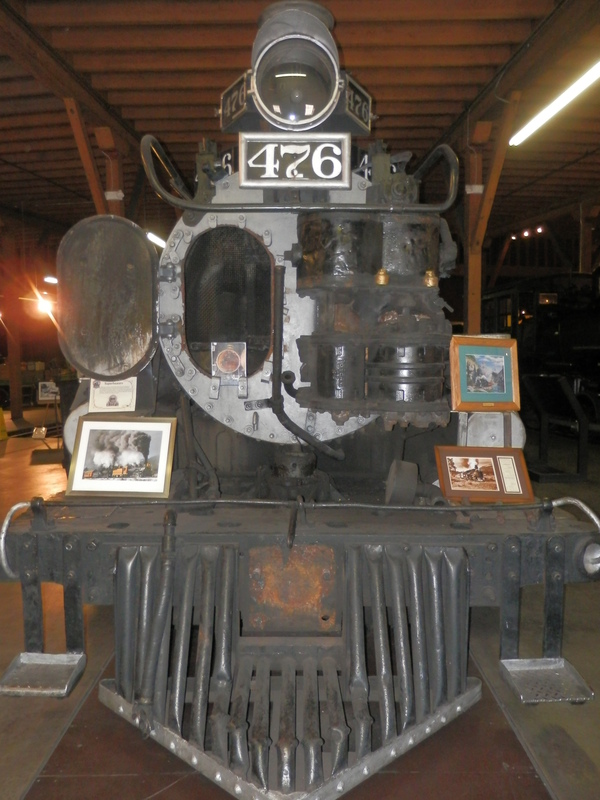 We could not leave the town without visiting the railroad musuem and wander among the vintage steam trains and huge model railway layouts. Everybody we met during the trip, on hearing that we had been to Durango, asked whether we had taken a ride on the railroad, so it sits high on a list of things to do when we are next passing by. We finally dragged ourselves away from Durango just before noon, joining the US-160 East towards Pagosa Springs. Once we had passed a series of out of town plazas, stores and malls, the scenery reverted to the same look as we had encountered the day before – rolling hills with periodic farms and homesteads, embraced by the San Juan National Forest. The occasional yellowing of the trees that we had observed more than a week before in Utah was becoming more widespread as we drove through Bayfield and Chimney Rock. A raccoon in the middle of the road was added to the growing list of animal species we had seen splattered by passing traffic. 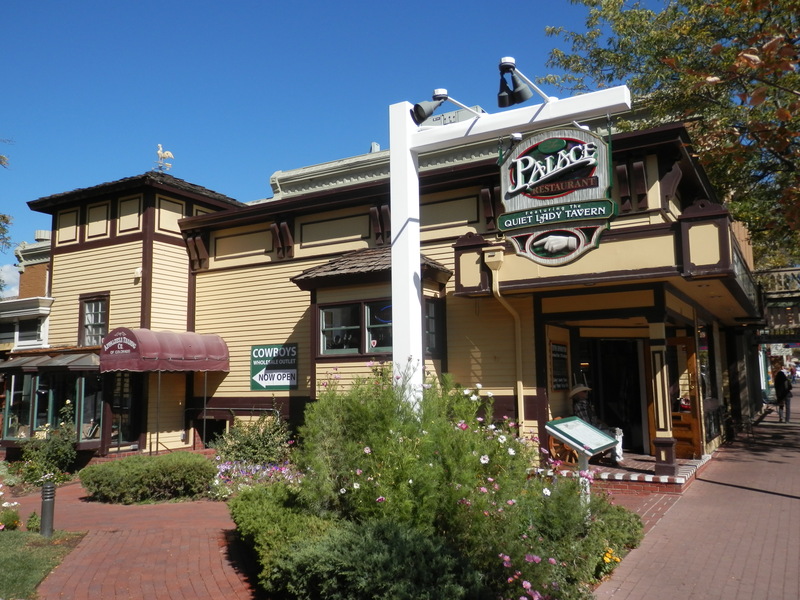 We were scheduled to turn south at Pagosa Springs onto US-84 a few miles north of the New Mexico county line, but as with so many spread out U.S. towns, it was difficult to establish where the centre was. Dubbed “The Best of Colorado” it seemed to go on forever! But just as we were about to concede that we had unaccountably missed the turning, we reached downtown (we think), took the opportunity to avail ourselves of the restrooms of a local bar (me) and gas station (Janet), and check the map. In fact, the turning was visible around the next bend. My map reading reputation was intact! In view of our substantial breakfast and late departure from Durango, we agreed to kick on and take our chances with lunch. This part of southern Colorado and northern New Mexico was undoubtedly cowboy country as the profusion of ranches (Squaw Valley, Crowley Creek and Spring Creek to name just a few) indicated. We even saw a large head of cattle being herded into a field by a group of men in full western regalia. We were welcomed into “New Mexico: The Land of Enchantment” with spectacular lightning strikes over the mountains ahead, though these amounted to nothing. With Santa Fe still more than a hundred miles away we pressed on through the distinctly Mexican sounding communities of Los Brazos, Los Ojos, Ensenada and Tierra Amarilla. Even the majority of stations on the car radio were now playing mariarchi music and the advertisements were in Spanish. We were still in the US but……………. The San Juan National Forest had given way now to the Carson National Forest to the east and the Santa Fe National Forest to the west. At Cebolla we encountered a stray dog sauntering along in our lane – at least he was alive, and remained so after we had swerved round him (I’m assuming it was a him though I didn’t check the gender). Much more exciting was the sight of a roadrunner scooting in front of us a little further on. It would appear that he had already shaken off Wily Coyote (no change there then). I have already embarrassed Janet once in this diary about her being caught short so I will not mention the unscheduled stop we had to make 50 miles short of Santa Fe to allow her to make the acquaintance of a (very) small bush in an otherwise unoccupied picnic area. Placitas, Abiquito, Chamita, Espanola, Arroya La Madera and Medalanes were left behind as we targeted a 4pm arrival in Santa Fe. Lunch had been forgotten in our quest to get settled at one of the stops we had most looked forward to. As we approached the town we experienced heavier traffic than we had been accustomed to all vacation. 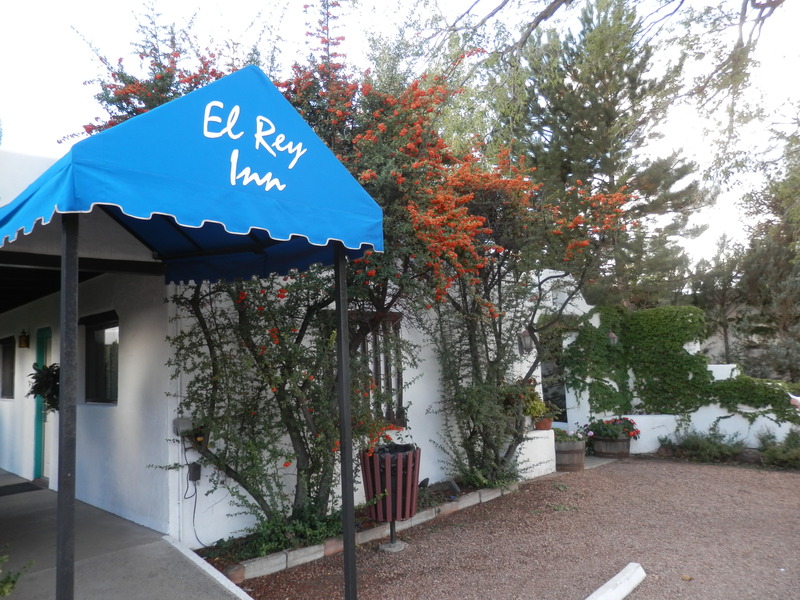 Nevertheless, we found the El Rey Inn without too much difficulty. 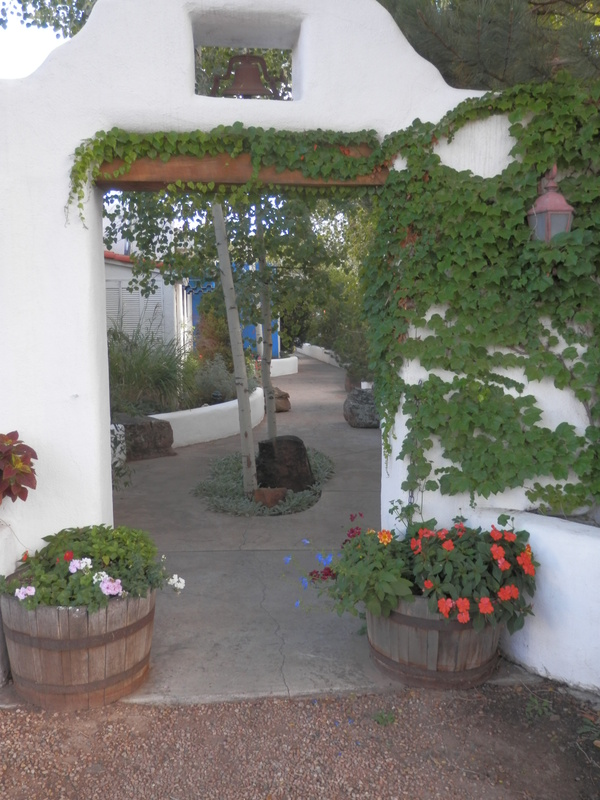 Built in a traditional northern New Mexico adobe style, the El Rey Inn opened in 1936 with just 12 rooms, since expanded to 86. The rooms and suites occupy 5 acres landscaped with trees, shrubs and flowers. Each room is unique, decorated with southwestern-style furniture and antiques. 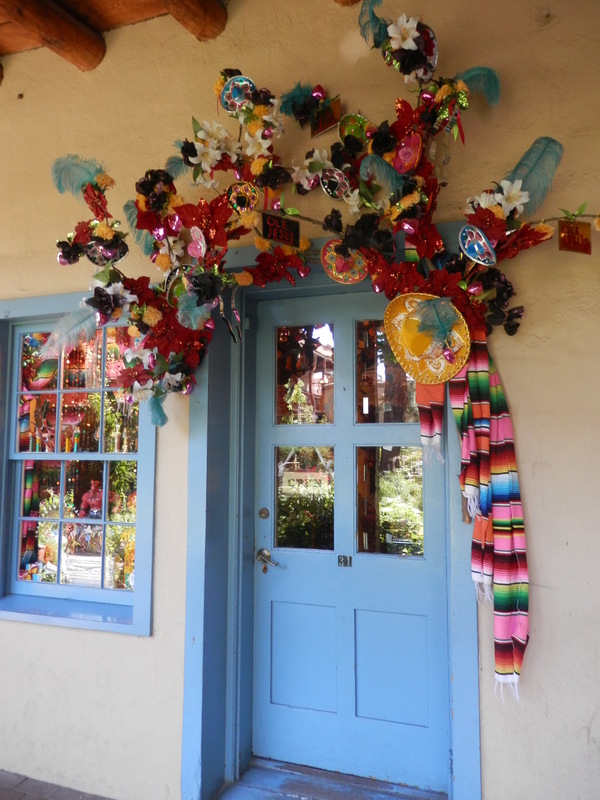 The inn itself boasts paintings, murals and sculptures from around the world. After a brief walk around the grounds, we prepared ourselves for what would be a long overdue meal in town. As the trolley had stopped for the day, this necessitated a taxi ride into the plaza. Having barely eaten since breakfast we wasted little time in selecting where to eat. 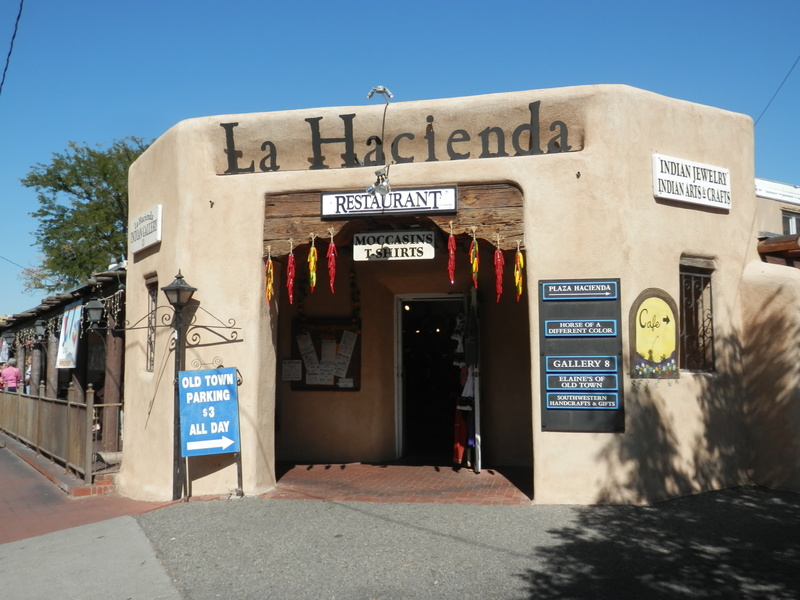 Santa Fe’s most famous hotel, La Fonda, has an award winning dining room, La Plazuela, at which we were fortunate enough to arrive when a table was about to become vacant. Just off the lobby, the restaurant is in a lovely conservatory style setting with two trees filled with lights and a small central pond sharing the space with the solid, beautifully decorated wood dining furniture. 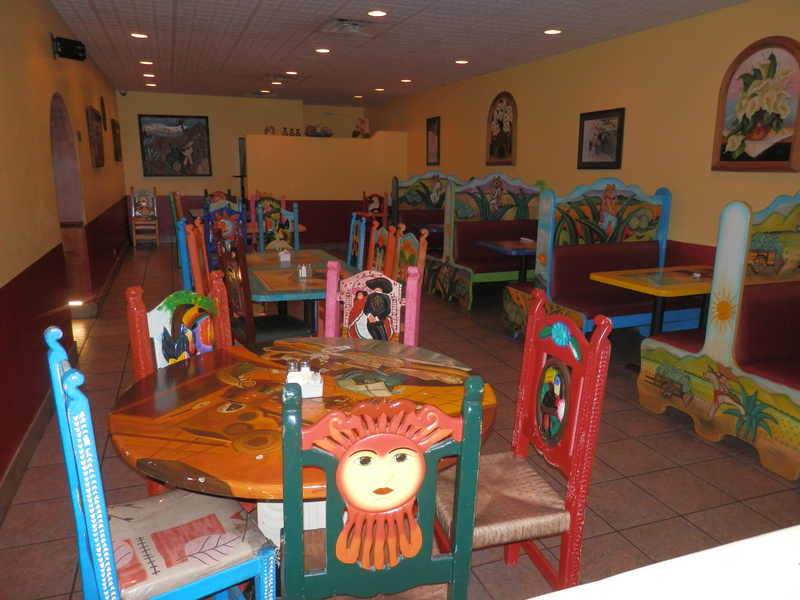 Delicious enchiladas (again), excellent service and a warm atmosphere made for one of the best dining experiences of the trip. The evening was capped off with a single dollar taxi ride back to our hotel, an arrangement that I’m sure, dear reader, you would like to see replicated in your town. We were even regaled with stories of the “mob” in Las Vegas by the driver who seemed to have several “buddies” with connections – well worth his 500% tip! Buoyed by two good night’s sleep in Moab we were refreshed for what would be one of the longest road journeys – around 290 miles – of the entire trip before we reached our next overnight stop of Durango, Colorado. 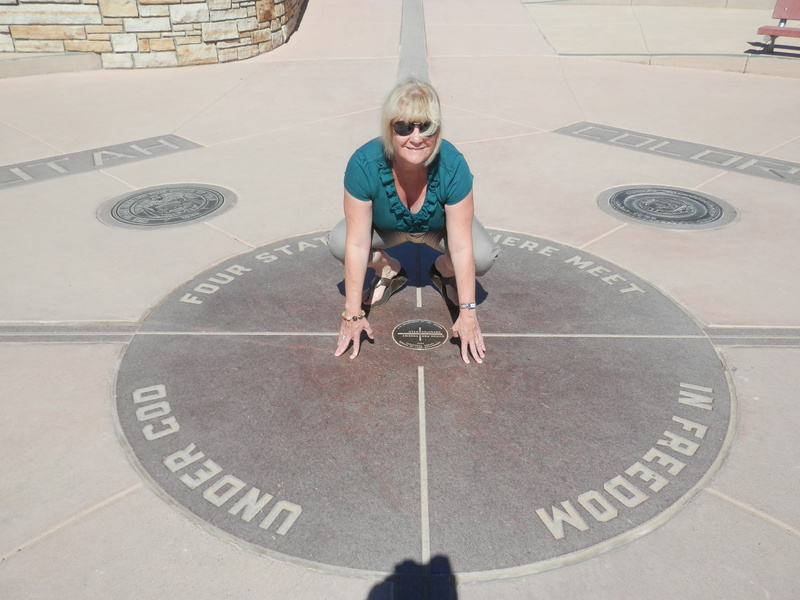 Two conscious decisions led to this – firstly, to make a detour to visit the Four Corners Monument and secondly, to ignore our trusty route planner’s recommendation to travel as far south on US-191 to Bluff before heading east, and cut off earlier at Monticello to pick up the 491. We were to make yet another detour, of which more later. 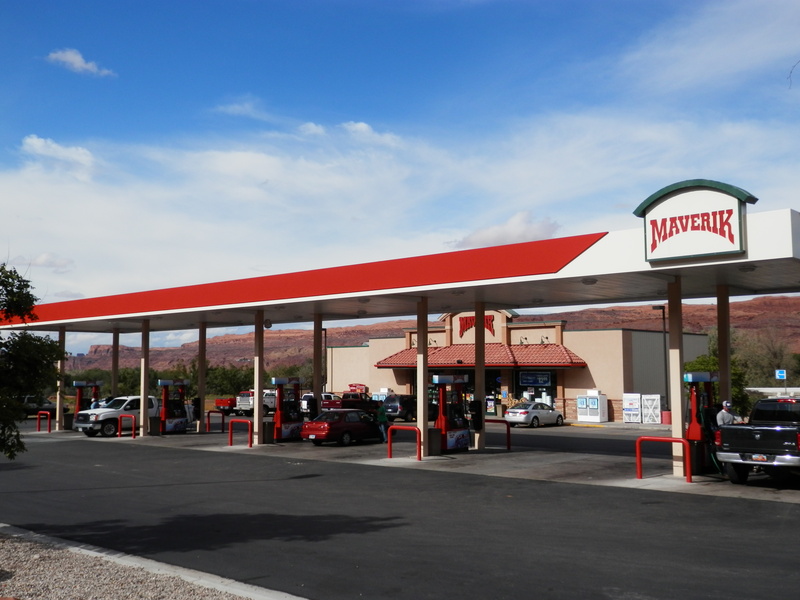 Having filled up at the Maverik gas station (this chain was a regular source of cheap fuel throughout the trip), we set off in the company of the customary blue sky (the rain on our journey into Moab two days previously had been a momentary aberration) and soon found ourselves alone on the road. After 53 miles we took US-491 at Monticello as the Eagles sang on the in-car CD player “put me on a highway, show me the sign”. Well, the next sign we saw was one welcoming us to “Colorful Colorado”. We had left, at least for now, the dramatic sandstone formations that had dominated the landscape for much of the past week. The area was a blend of flat pastureland and forest, dotted with the occasional homestead and small ranch, outside which horses and cattle grazed. The Eagles were soon usurped by Kiss Country Radio 97.9 FM (“Keeping Cortez, Farmington and Durango country)”, which was to be our companion for the remainder of the day. Dove Creek was the first town of any substance in Colorado with its business park and small airport. Further evidence of the growing number of grazing livestock was an advertisement on the radio for feed grains. We were amused by a sign that announced that the Colorado Welcome Center was another 34 miles, an indication of the vast scale of this nation that you had to drive 50 miles before you could be officially welcomed to the state! The San Juan National Forest which was to follow us all the way to Durango began to assume greater prominence as we passed the settlements of Cahone, Pleasant View, Yellow Jacket, Lewis and Arriola. 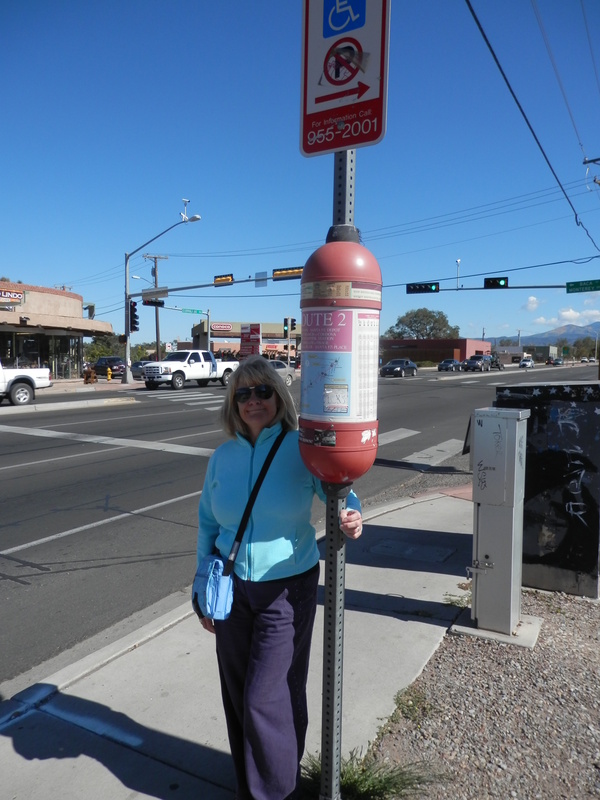 At Cortez, the largest town on today’s journey but one beset by roadworks, we eschewed the signs for Durango and branched south towards the Four Corners Monument. Shortly afterwards, a low mountains range denoted that we were entering the Ute Mountain Indian Reservation. Once notable hunters, the Utes had been split up and relocated to poorer land by the white settlers’ westward expansion. 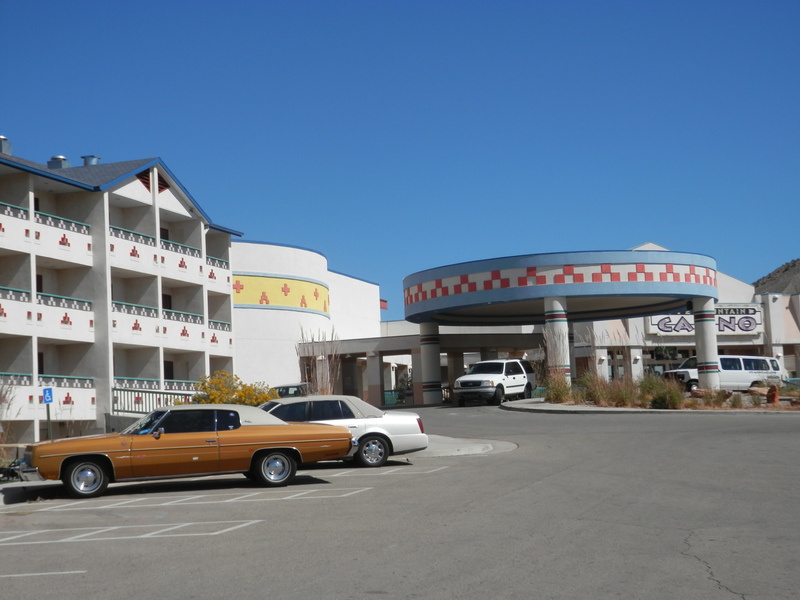 However, mineral leases and tourism had enabled them to build an impressive casino, hotel and resort (pictured above) where we halted briefly for free if indigestible coffee, restrooms and a futile flutter on the penny slots. We managed to miss the turning for the Four Corners initially, but recovered the route within three miles. Had we taken the right road we would have avoided almost getting crushed by an immense truck turning left into the road at which junction we were sitting. The driver, equipped with almost obligatory drooping moustache and cowboy hat (not unlike the Dennis Hopper character in Easy Rider), did not seem amused, but his cargo of blindfolded horses appeared less concerned. Crossing the San Juan River we arrived at the Four Corners Monument, the only spot in the U.S. where four states (Utah, Colorado, New Mexico and Arizona) meet at a single point. 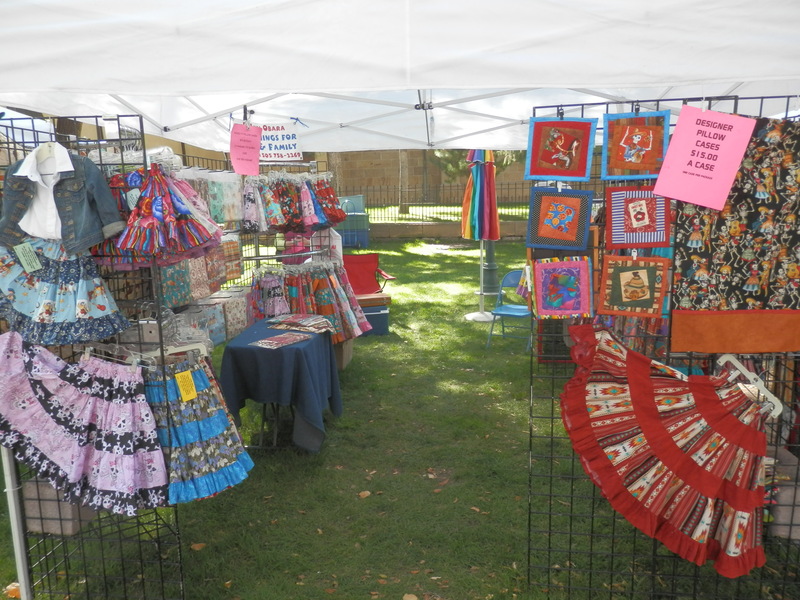 Whilst that might sound glamorous, the reality is less so – it is a barren, hot (77 degrees) and dusty place, given over to the presence on all four sides of the ubiquitous Indian gift stalls (we were back in the Navajo Nation at this point). That said, in addition to doing the tourist thing and having our photos taken spanning all four states (I was surprised we were not charged for the privilege), we picked up some lovely t-shirts. 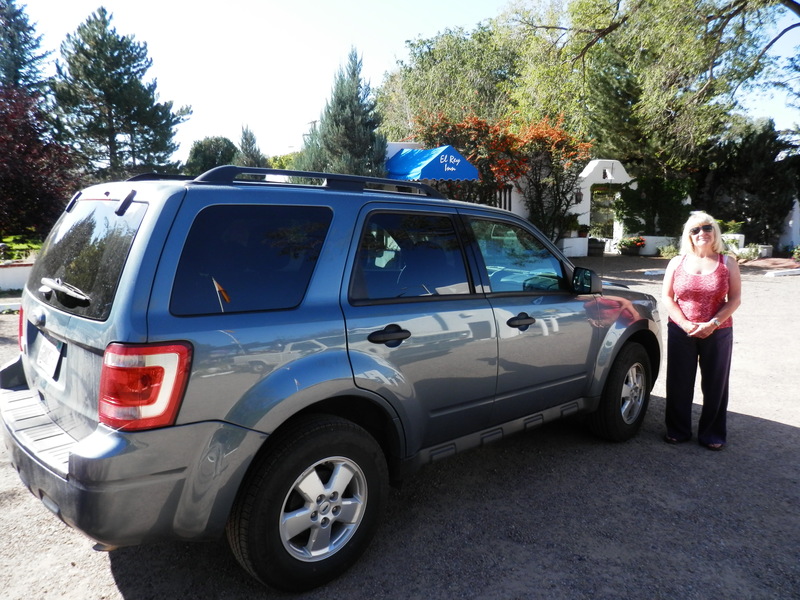 So pleased with our purchases were we that we then contrived to leave them behind in our motel room in Durango the next morning. Happily, thanks to the kindness of the proprietor and a payment of £25 to UPS, I can now report we have just taken custody of them again at home. We had to retrace our “steps” (around 30 miles) to traffic-ridden Cortez before continuing our journey to Durango on US-160 East. But lunch now beckoned. My vegetarian past cruelly cast aside, I had harboured a craving for a Wendy’s hamburger ever since our flight had touched down in Las Vegas eleven days before, and, as luck would have it, an outlet cuddled up to us just as we were pulling out of town. I’m not sure this is what Jimmy Buffett had in mind when he sang Cheeseburger in Paradise but my double was scrumptious. Janet also enjoyed her crispy chicken sandwich. Our unfamiliarity with fast food burger joints was exposed, however, when we ordered two vanilla iced frosties, thinking they were coffees (a la frappuccinos), only to discover, not unpleasantly, that they were in fact milk shakes. And all for less than ten bucks. With only 46 miles to Durango we decided to call in at Mesa Verde National Park en route. 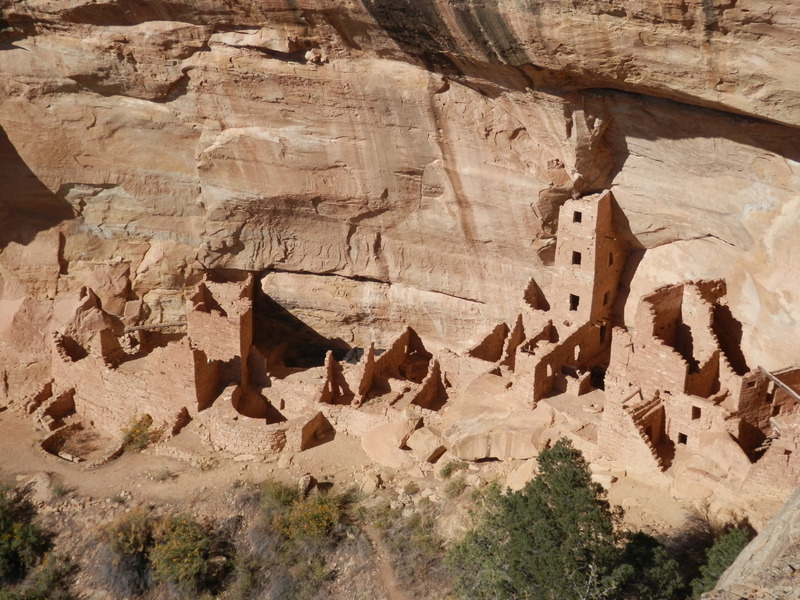 When we revamped our original itinerary to include the loop through New Mexico (Santa Fe, Albuquerque and Gallup), we had been required to drop Canyon de Chelly and Mesa Verde. But it was not until now that we fully realised just how close it was to the road we were taking, and even though time would not allow us to explore it as fully as it deserved, it would be crazy not to spend a couple of hours there. 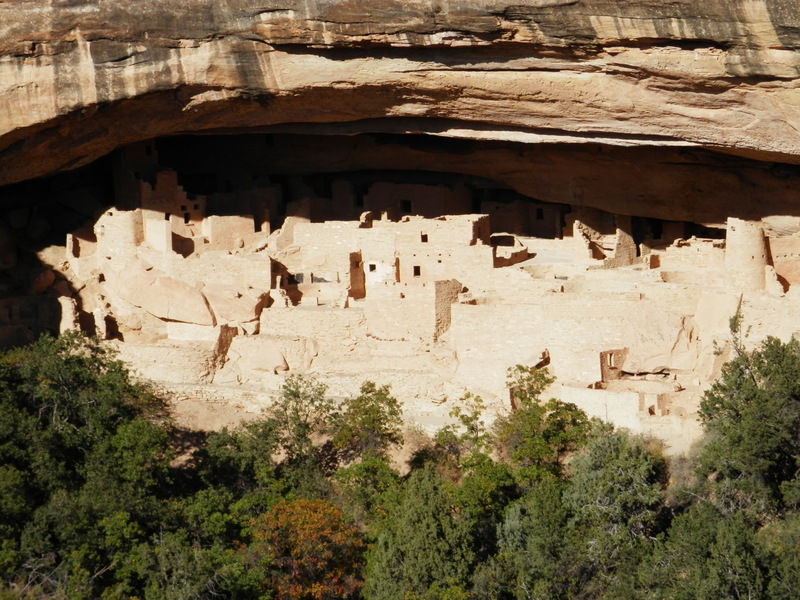 Mesa Verde (“green table” in Spanish), the only U.S. national park exclusively devoted to archaeological remains, was home to the Ancestral Puebloan people between 550 and 1300AD, at which stage they mysteriously abandoned the cliff dwellings that had been their home. 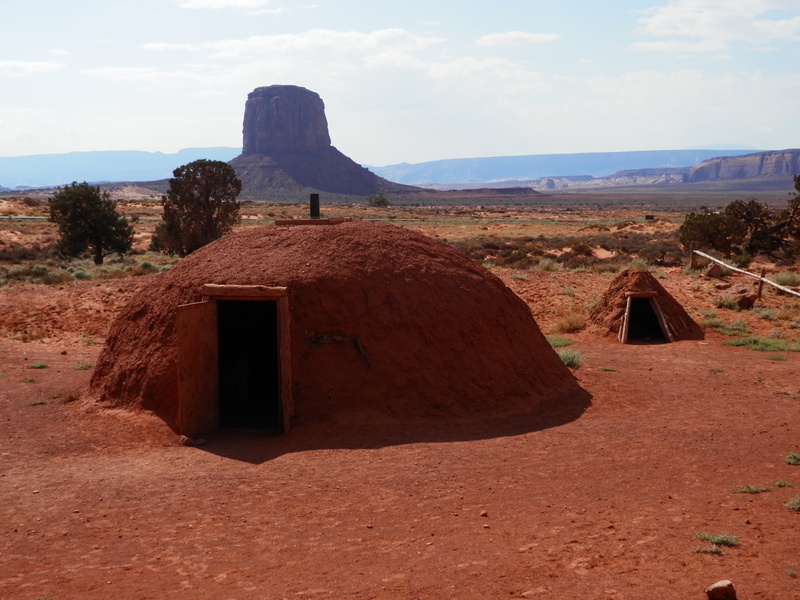 Formerly nomadic, they had turned to hunting and lived in pithouses clustered into small villages usually built on mesa tops but sometimes in cliff recesses. We can only speculate why they lived in these secluded alcoves. Perhaps it was for defence or it may have been because they provided better protection from the elements, or even for religious or psychological reasons. Whatever the purpose, they are astonishing buildings, some of them remarkably well preserved. Unfortunately, we hadn’t sufficient time to join one of the ranger-led tours into the best preserved cliff dwellings, but we did take the self-guided Mesa Top Loop Drive which afforded us some excellent views of both the internal layout of the pithouses and overlooks of some of the villages. Leaving Mesa Verde we drove through the Mancos Valley with the San Juan Mountains overhead. Mancos proclaimed itself as “Where the West Still Lives”, a not unreasonable boast as the scenery was taking on a distinctly more cowboy country feel. But this was clearly under some threat as a large picture of a cow was accompanied by the words “I’d rather be a cow than a condo”. 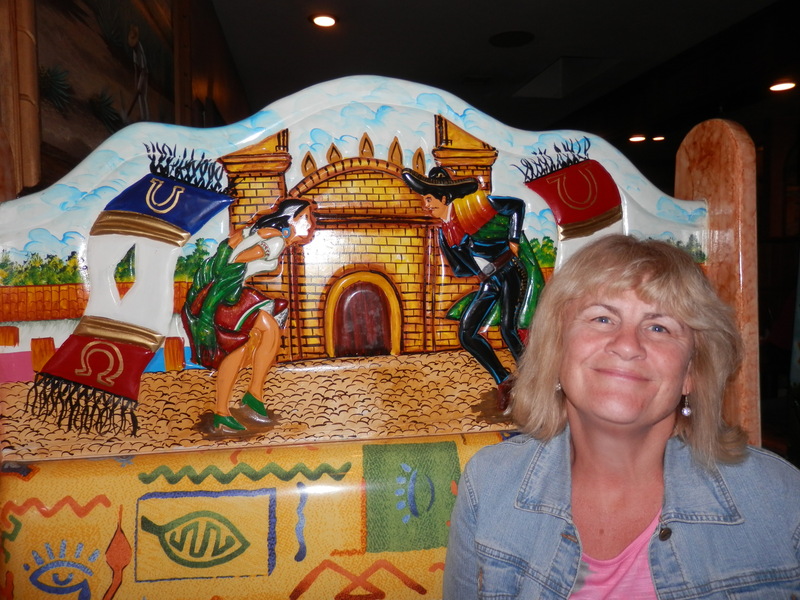 After checking in at the Econolodge motel in Durango we took the free trolley to the historic downtown for dinner at Tequila’s Family Restaurant, a beautiful tex-mex establishment with dazzling, colorful furnishings. My seafood enchiladas were the best I had ever tasted and the margaritas were delicious. And it was also inexpensive. The experience was topped off by our server, Hector, dashing back to our table before we left to thank us for his tip. 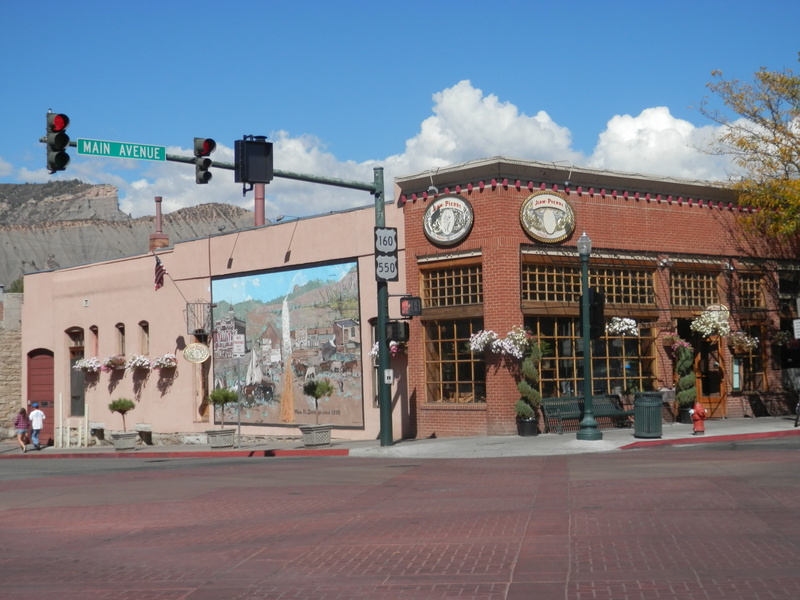 As the next day’s journey would be much shorter, we resolved to spend the next morning exploring downtown Durango before setting off for our next stop in Santa Fe, New Mexico. 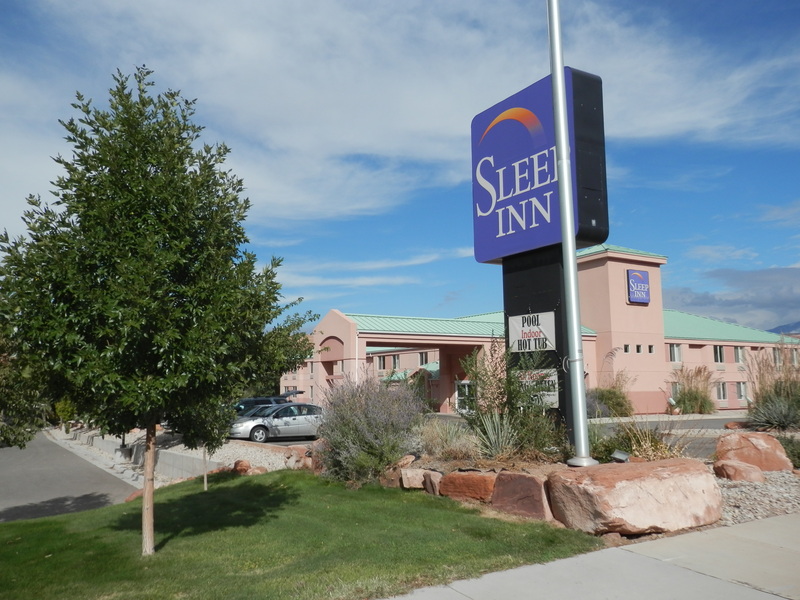 The experience of staying in the Sleep Inn in Moab was enhanced still further with an excellent breakfast. We even managed to find the table with the TV remote control laid upon it, enabling me to swiftly change the channel from Fox News to CNN. Fortunately, nobody else noticed or, even with the presidential election a little over a month away, was interested. 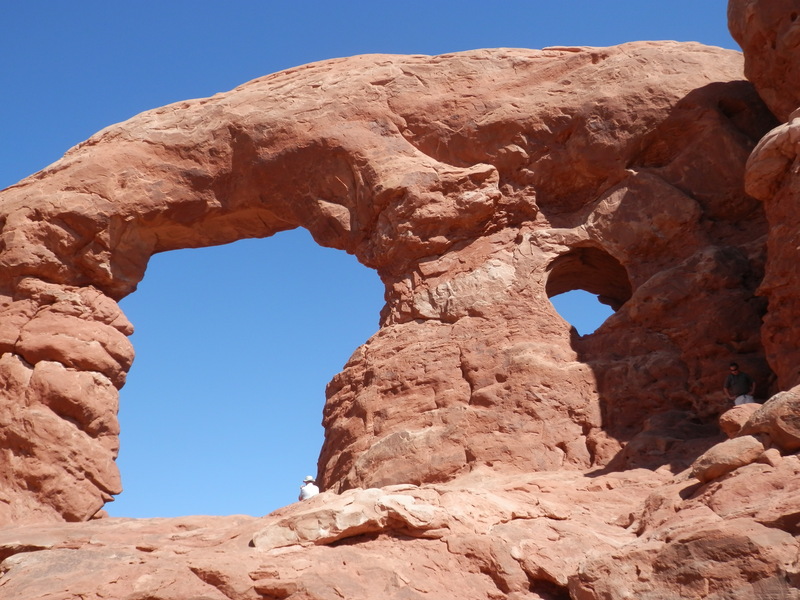 Today we were making the last of our planned visits to national parks, namely Arches. The annual pass purchased at Zion had already proved a tremendous bargain. After the short drive from town we called in at the visitor center first to top up on water and seek advice on the trails. 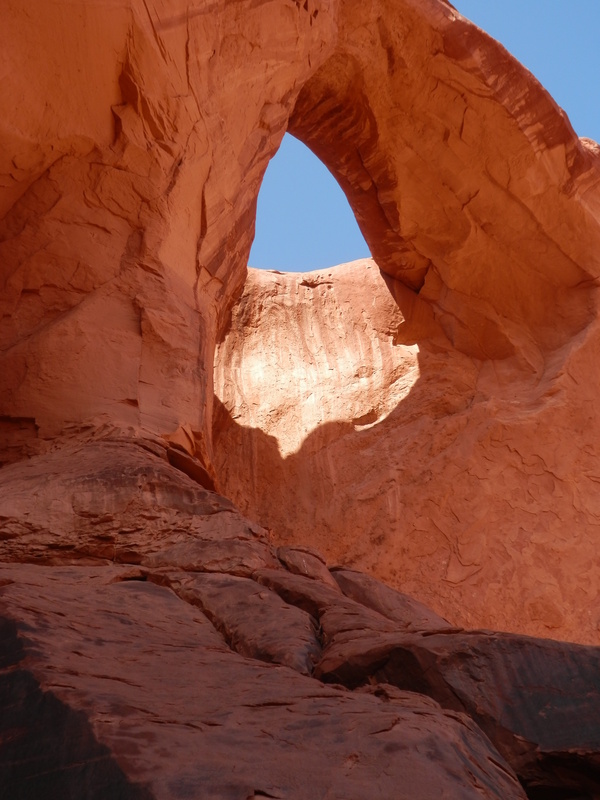 The most recognisable of the park’s estimated 2,000 arches is the 45 by 33 feet Delicate Arch (above), which features on many state products, including official vehicle license plates. The walk is a three mile round trip with an overall elevation gain of 480 feet. After the first half-mile, a well-defined trail, it becomes increasingly strenuous with a steep section of exposed slickrock, which lives up to its name in damp weather (not a hazard we had to deal with). The hiker is dependent thereafter upon a series of rock cairns (several small rocks, sometimes precariously, placed on top of each other) and the advice of others returning from the summit to ensure they are on course. The most precarious element of the trail, and the one that made me a little uneasy, is a 200 yard “narrow” ledge overlooking a sheer drop immediately before reaching the arch. Whilst I negotiated it comfortably enough, I felt it prudent that I should hand over photographic duties to Janet whilst we remained there. Unfortunately, it was a little hazy at this point, though by the time we had passed the end of the ledge on our descent, the sun had come out, causing Janet to bound back up the ledge to take more photos whilst I averted my eyes and settled my nerves with a peanut granola bar. 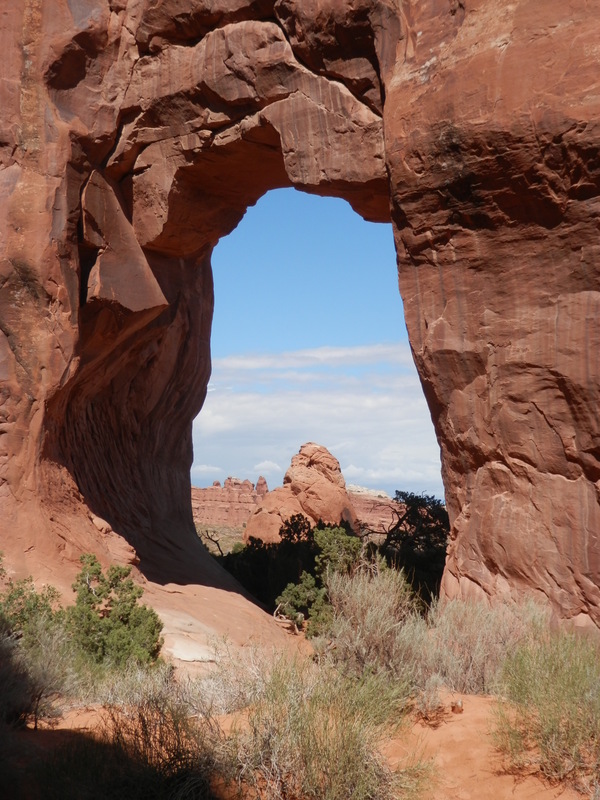 Having accomplished our first objective, we undertook a number of shorter and less demanding trails, principally the 300 foot Landscape Arch (1.6 miles) and the smaller Pine Tree Arch and Tunnel Arch. 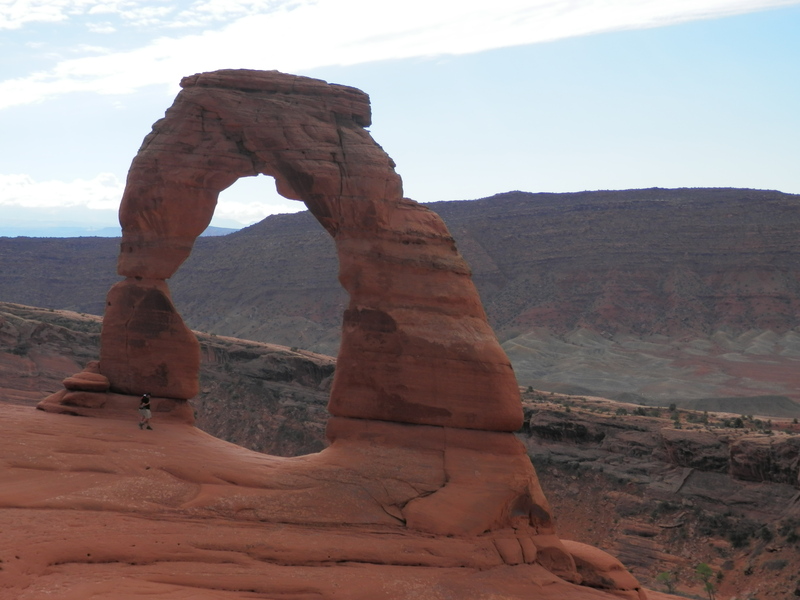 Although Delicate Arch was indeed impressive, we were a little underwhelmed at this point. But the longer we spent in the park the more it grew on us. We began to understand why many people refer to its otherworldly atmosphere and liken it to a moonscape. 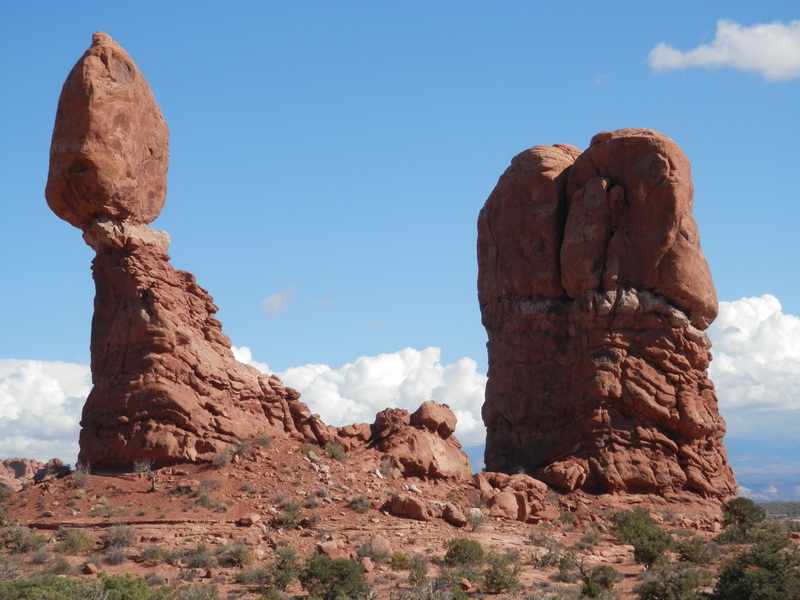 At every turn there were bizarre groups of rocks thrusting from the desert landscape. As with Bryce Canyon in particular, it was tempting and entertaining to compare them with other living and inanimate things. Many bore an uncanny resemblance to a gigantic male protuberance, though that might just be in the eye of this particular beholder. You may, of course, see nothing in such a salacious suggestion. 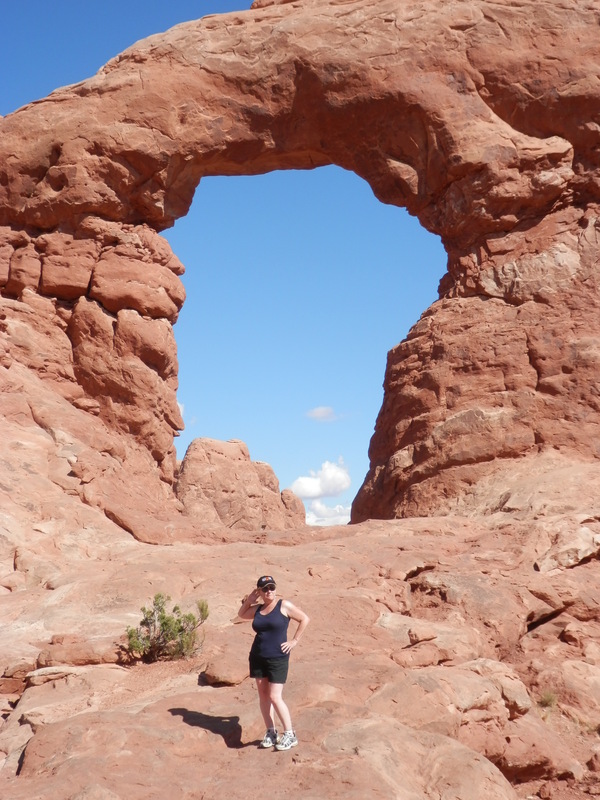 We encountered what, for us, were the most beautiful arches on the short (one mile) Windows loop. This is a collection of three arches – North Window, South Window and Turret – that face each other across the dusty scrub-like terrain. We must have spent an hour clambering among the rocks and, where possible, dipping in and out of the arches, taking innumerable photographs (many of which, inevitably, included strangers doing the same). But patience and perseverance paid off as the following picture illustrates. 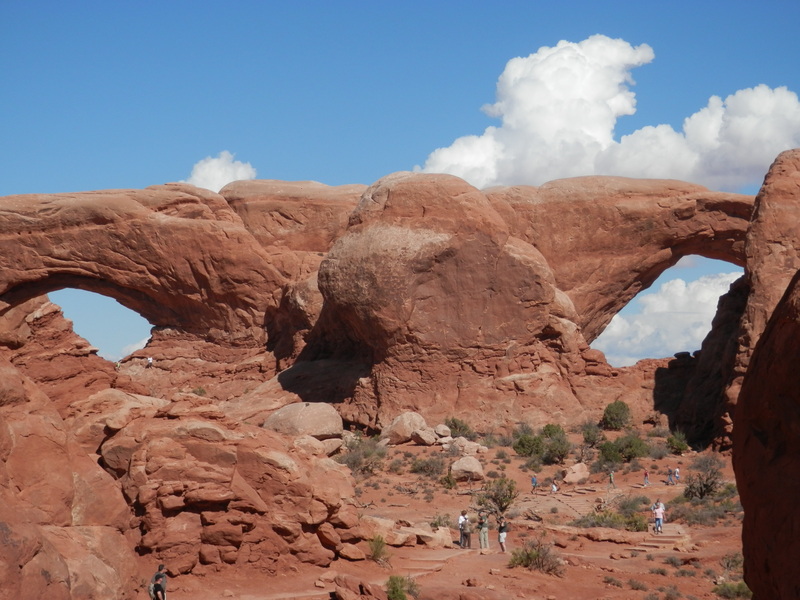 This was one of the highlights of the whole trip for me – these stunning structures dwarfed the more celebrated Delicate and Landscape Arches in their emotional and aesthetic impact. 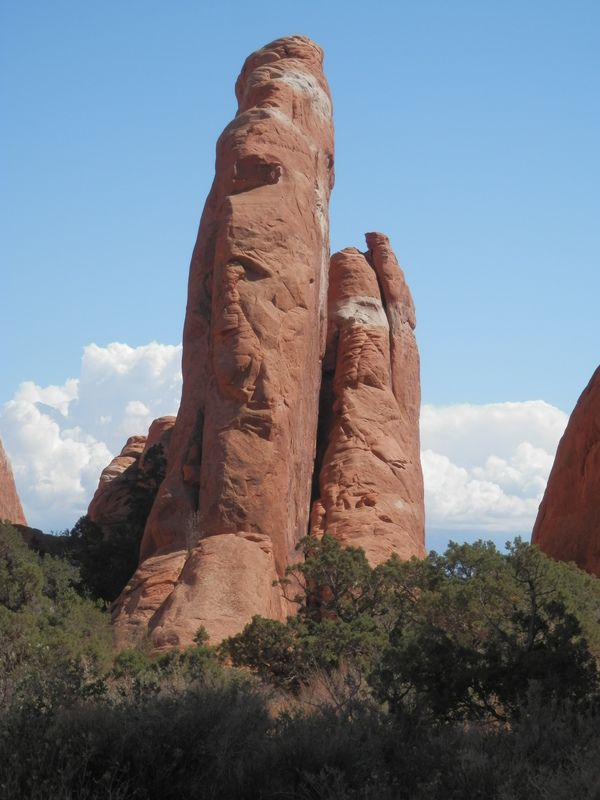 After dragging ourselves away from this fabulous playground, we moved across to Balanced Rock before leaving the park. 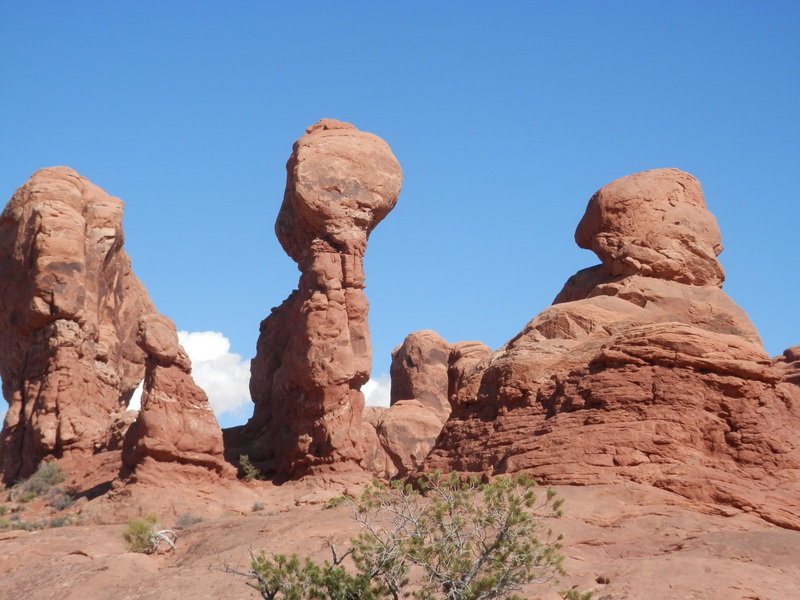 This is one of the weirdest rock formations of all – fragile, funny and picturesque. I have my own thoughts on what these resemble. What are yours? Such was our fascination with this extraordinary place that we were forced to postpone our proposed afternoon trip to Dead Horse Point State Park. Nor had we had any lunch (there are no refreshment facilities in the park) and it was nearly 4 o’clock in the afternoon! We drove back into the centre of Moab and, after a brief exploration of the gift shops, parked ourselves outside the Peace Tree café, where our coffees were supplemented by portions of pecan pie and chocolate brownie with ice cream that would hardly have looked out of place in the park we had just left (though I think the comparison ended there). 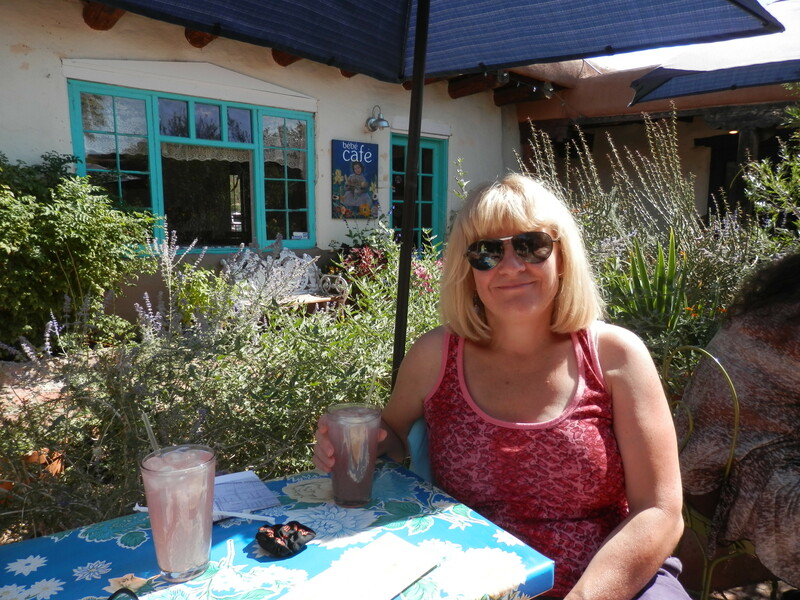 The day was rounded off with a fine meal (shrimp pesto linguine for Janet and roast chicken with garlic red potatoes for me, accompanied by another white Zinfandel – oh yes, and two margaritas each) in the Moab Brewery. It had been our third visit in a little over 24 hours and we were sorry to leave it. Once again, we had an excellent night’s sleep in The Sleep Inn. Must be something about the name or perhaps the exercise we had done – or more likely the margaritas. 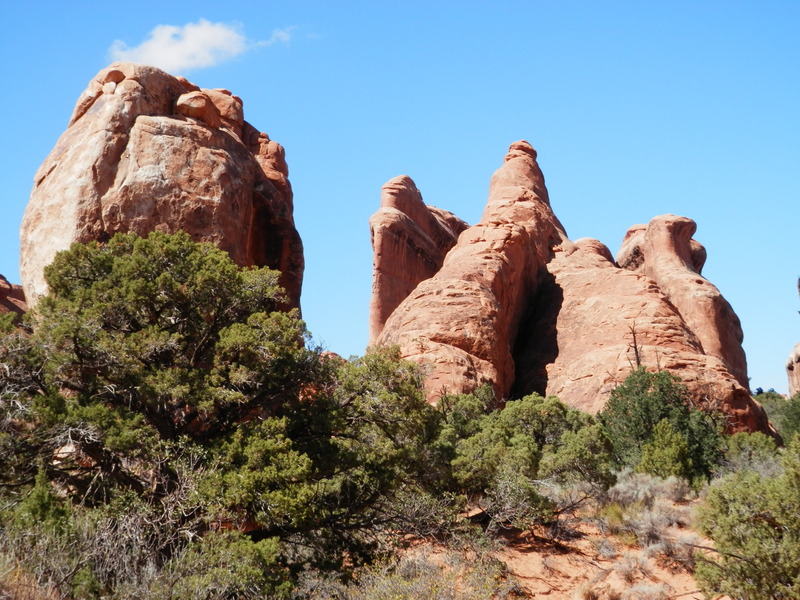 We knew that visiting the Arches National Park obliged us to return to Utah. But we were not concerned as we knew that Moab, our base for the next two nights, was more socially enlightened than the towns we had stayed in at the beginning of our trip. It even had its own brewery! Humbling and inspiring though our excursion to Monument Valley had been, our stay in the area was not an unqualified success. 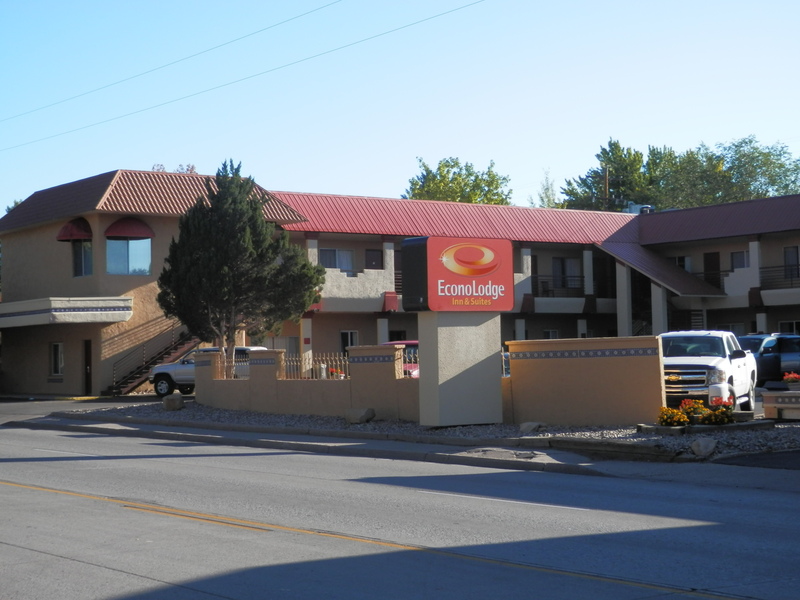 Being able to check in at noon at the Hampton Inn in Kayenta did not prove as beneficial as we had first thought. Our room may have been spacious, comfortable and well furnished but it was next not only to the lifts but also the 24 hour (sic) laundry and ice vending machine. You should be able to glean from that what sort of night’s sleep we had, or rather didn’t have. It was unquestionably the most, and possibly only, noisy room in the entire hotel. We had also been advised at check-in that we did not need to reserve a table for dinner as the restaurant would not be busy. As we were late back from Monument Valley, it was 9pm before we were ready to eat. As we approached the lectern the signs looked ominous – the foyer was full of glum, exasperated fellow residents sprawled on armchairs and sofas. Sure enough, we were told we would have to wait an hour. With alternative dining options in the vicinity severely limited we had no choice but to sit it out. It was indeed around 10pm before we sat down to dinner, to be greeted with the news that half the menu was no longer available. Even the consolation of a “proper” drink was lost on us as the beverage menu was entirely non-alcoholic! And then we couldn’t sleep. It was a pity that our experience of the Hampton Inn was so negative as it was an attractive place with a fine Indian gift shop. At least my complaint about the room did induce an offer of 50% off the (pre-paid) cost of the room by the manager, though it would require us to contact Expedia ourselves to secure the discount (which reminds me). Our journey north to Moab meant that we would be travelling initially on US-163, the road we had taken the previous afternoon through Monument Valley. This afforded us the opportunity to marvel once more at the landscape. 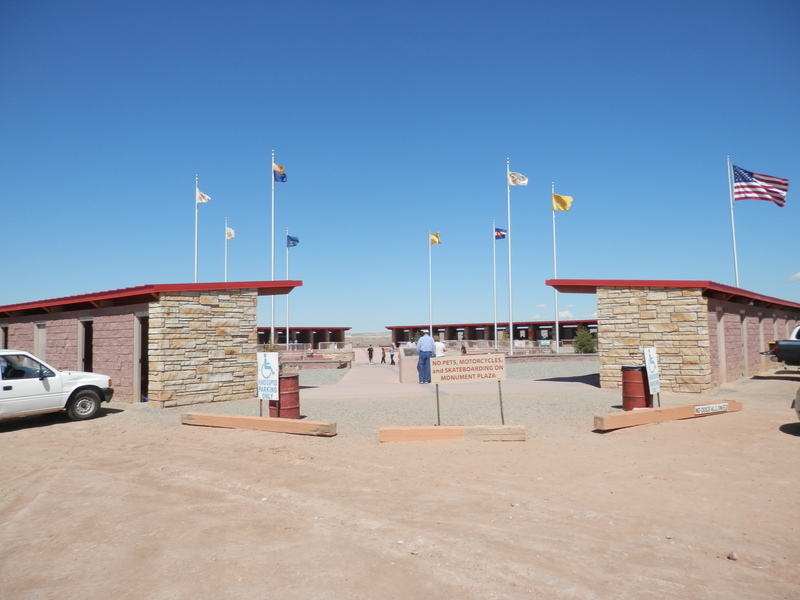 But not before visiting the Navajo Indian Center, a complex of hard standing stalls selling jewelery and sand art, just outside the entrance to the Tribal Park. 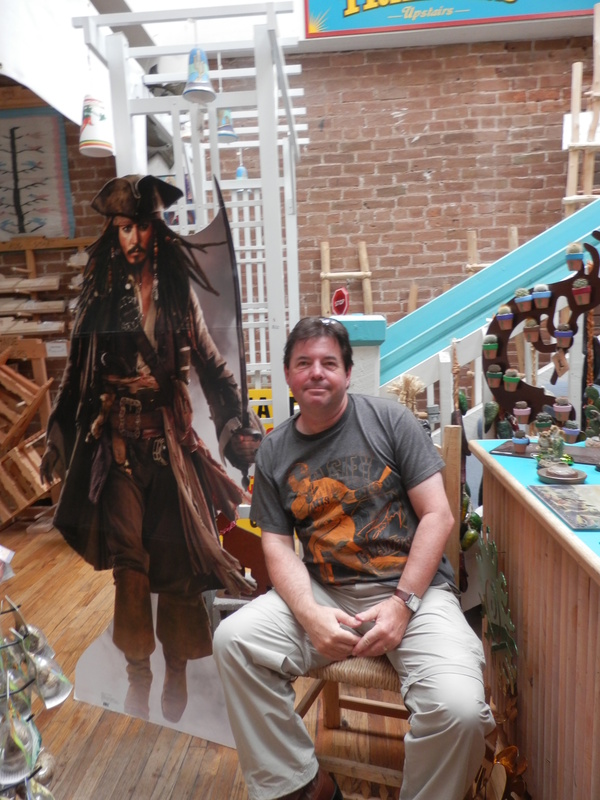 Once again, the retailers were all very friendly and genuinely interested in the details of our trip. It was difficult to prise ourselves away from the area as every few hundred yards of road opened up new perspectives and photo opportunities. 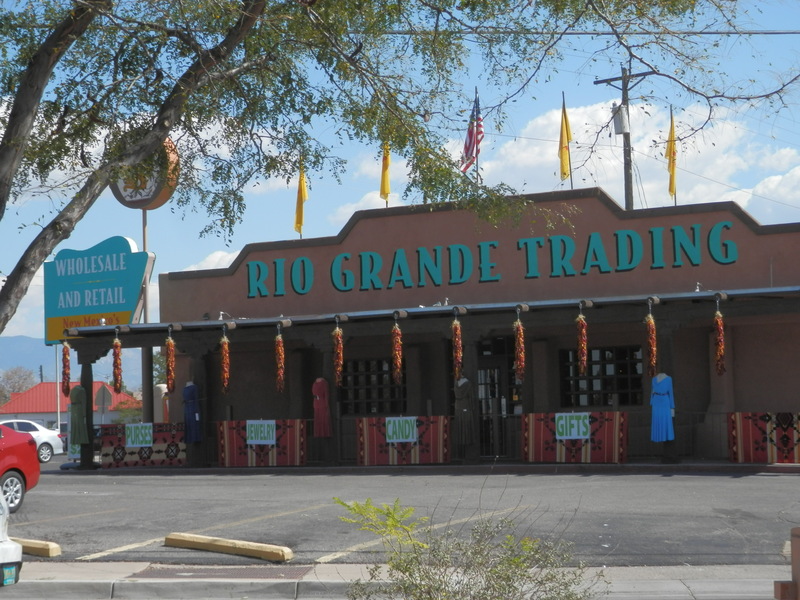 As we passed the sporadic, sometimes derelict, gift stalls by the roadside, it was difficult not to wonder whether their business was suffering from the competition provided by the Navajo Indian Center. Crossing into Utah we passed Halchita and Mexican Hat, where we swung right over the San Juan River. The landscape took on a generally flatter look and the familiar “big sky” that was such a feature of this trip returned. We joined the US-191 near Bluff as the skies, for the first time in the eight days we had been in the country, began to threaten rain and the temperature gauge dropped below 60 degrees. Distant flashes of lightning followed. We resisted the blandishments of Blanding, even though it claimed to be the “Base Camp to Adventure” and boasted both a dinosaur museum and a Fattboyz Grillin’ restaurant. We had become accustomed to roadside signs warning us to beware of animals crossing, but the flashing lights proclaiming “Car Deer Hits: 197”, followed shortly afterwards by the sight of one freshly slain, brought home the danger more forcefully. Dead wildlife by the side of the road was as common a feature of this trip as burst truck tires. As the rain finally arrived and the temperature fell below fifty (half of what it had been in Bryce Canyon a few days before), we had lunch in Subway at the Canyonland Store in Monticello, which announced itself as the “Home of the Hideout”. With a little over fifty miles to go I considered a comment made by an English woman we had met in Zion. 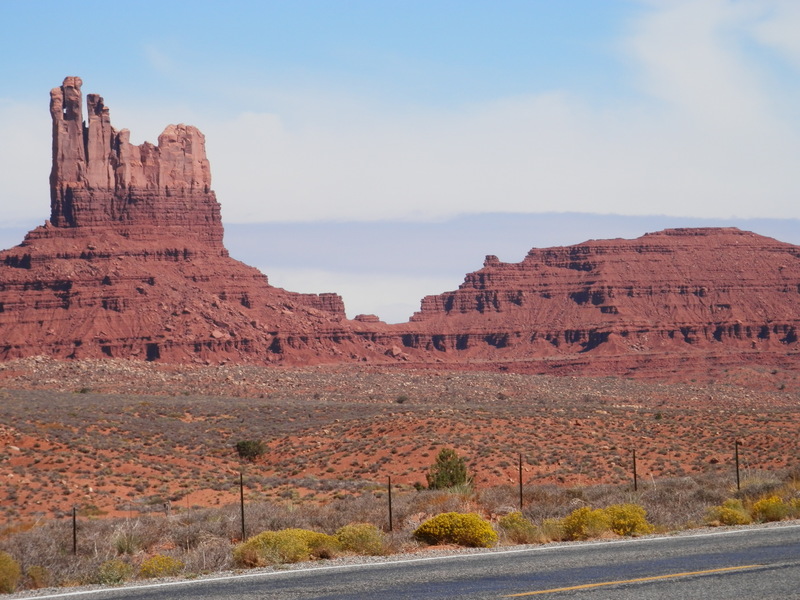 She had complained that the road from Monument Valley to Moab was “boring”. Well, this may not have been the most spectacular stretch of scenery on the trip, but boring it was not. The road itself may have been straight but there were still sporadic clusters of red rocks amid the desert, which became ever more prominent as we neared our resting place. And there was that “big sky” – how could one ever tire of that? 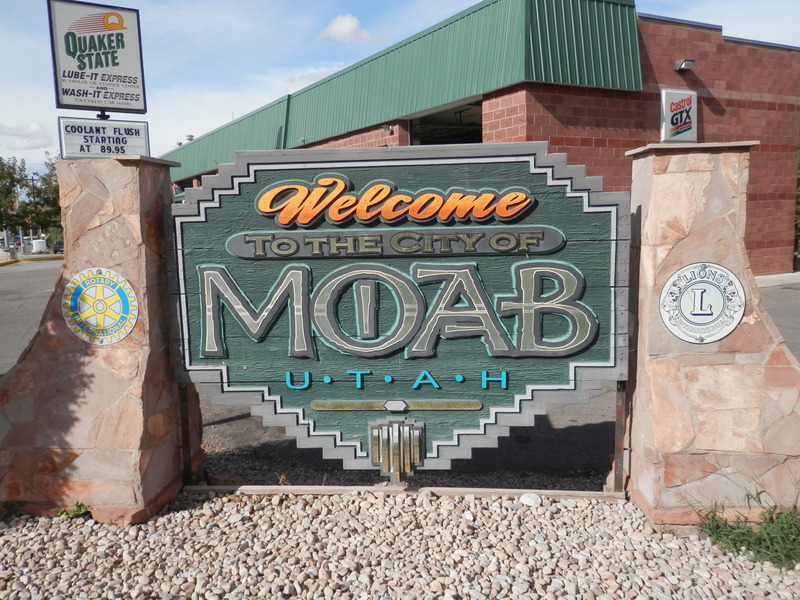 As we approached Moab and the sky cleared, one of the increasing number of signs extolling the comforts of its accommodation offer was one for the Moab Brewery, that oasis of sophistication in an otherwise dreary state. More surprisingly, it stated that kids were welcome, hopefully not a comment on the strength of the beer! We were greeted warmly by the proprietor at the Sleep Inn, though how the conversation got round to his enthusiasm for the seventies British sitcom Keeping Up Appearances, I cannot remember. Unpacking was peremptory as we prepared to stake out the Moab Brewery and a restaurant for dinner that evening. The only drawback to an otherwise excellent hotel was that it was a mile away from the centre of town and that, with a four lane highway and intermittent paths on either side, walking was an extreme sport. 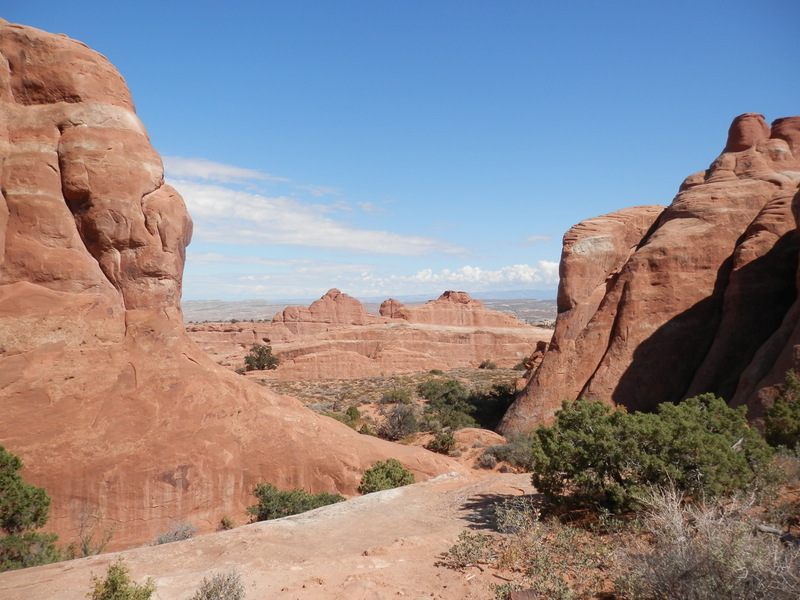 But when you consider that Moab’s modern renaissance has been borne out of its status as a haven for mountain bikers, rock climbers, jeep junkies, raft riders and hummer hammerers, I should not have been all that surprised. We negotiated the short distance to the thriving Moab Brewery premises, sat at the bar and ordered a Lizard Wheat Ale and Scorpion Pale Ale respectively before returning to the hotel to prepare for dinner. 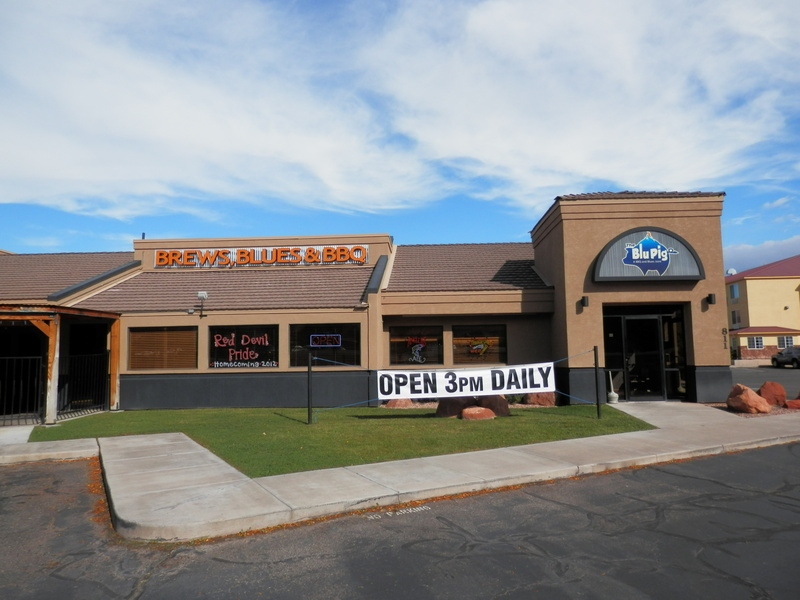 We ate later at the Blu Pig – Brews, Blues & BBQ restaurant where I had catfish and Janet enjoyed a mighty plateful of spare ribs, and we drank a bottle of – whisper it – wine, Beringer’s White Zinfandel to be exact. We then took our lives in our hands by venturing along, and then across, the highway in the dark for another glass in the Moab Brewery before retiring for the night. How unlike our evening experiences in Hurricane and Panguitch! OK, Utah isn’t so bad after all! And we slept too – after all, it was The Sleep Inn. 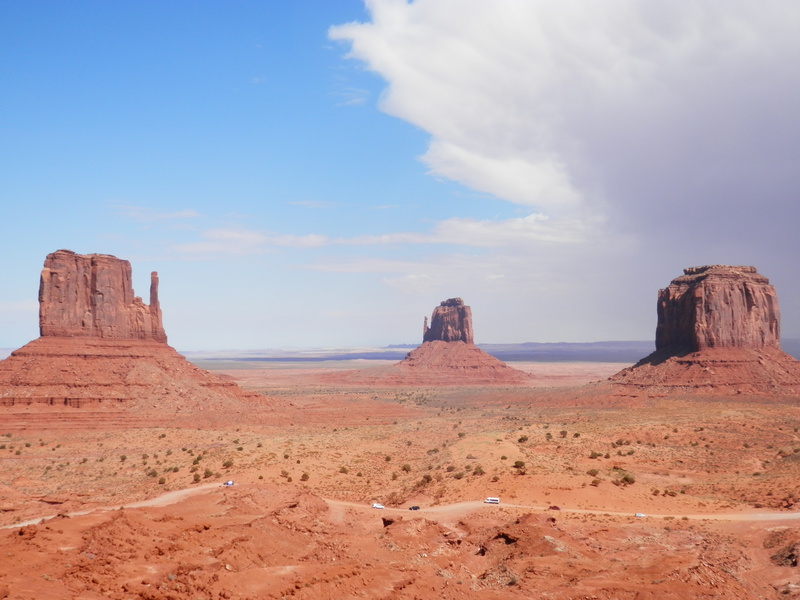 Our visit to Monument Valley Navajo Tribal Park had been the most eagerly anticipated part of our road trip, and a week after we had flown into Las Vegas, the day had arrived. 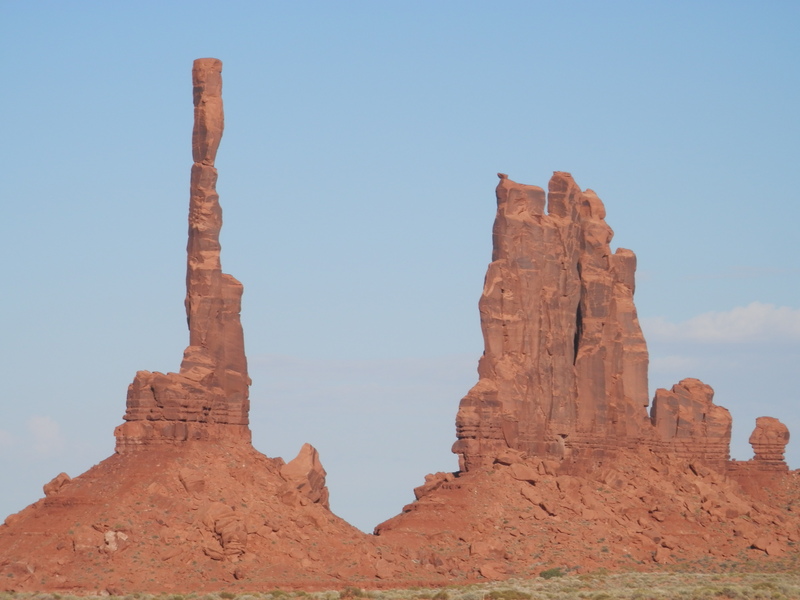 Although today’s drive from Page, Arizona was only 104 miles, we were understandably anxious to get an early start to maximise our time in the Navajo Nation. 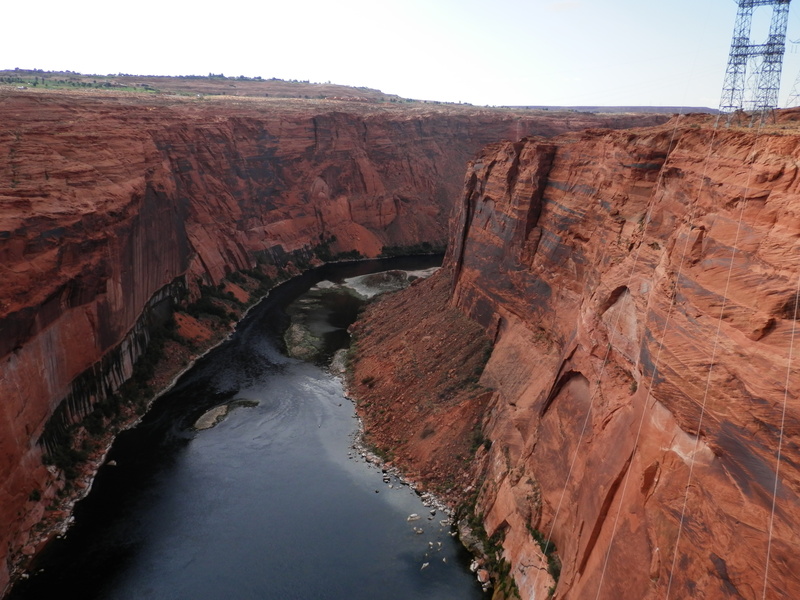 So the trip to Glen Canyon Dam in the cool morning air was a brief one. Janet’s smile in the photo above pre-dated her discovery, several miles down the road, that she had left her Team GB baseball cap in the hotel. Our customary diet of country and classic rock on the car radio seemed inappropriate for today, and we replaced it with Sacred Spirit II, More Chants and Dances of the Native Americans, the CD we had bought expressly for this leg of the trip. It was to play on endless loop for the next couple of days, lending a haunting, rhythmic backdrop to our travels. As we headed east we began to encounter a sight that would become very familiar over the next ten days – tables by the roadside containing native american jewelery and, on occasions, pottery and rugs made by local people. Some of it might have been tourist “tat” but there is no doubting that the business is a valuable, even essential, addition to the local economy. On some stretches of road, however, there were as many abandoned as thriving stalls, though most still flying ragged American and Indian flags. More upscale trading posts, notably at Shonto, provided a shinier, and more expensive, face. 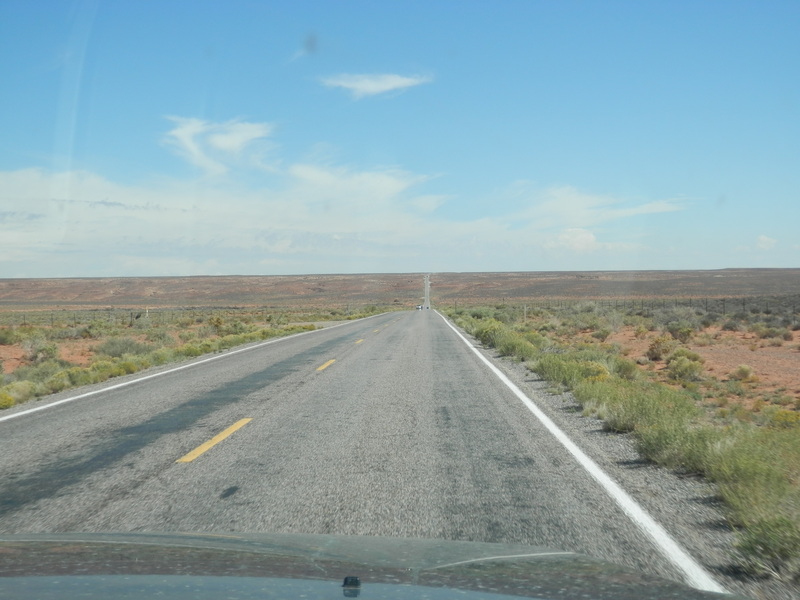 Much of US-98 through Kaibito and Shonto was scrub and desert with occasional homesteads and trailers dotting the landscape. As we turned onto US-160 the amount of traffic increased, though as on this entire road trip, such statements are relative – it meant that we were joined by a handful of vehicles travelling in either direction. Congestion is almost an unknown concept in this land. That said, a huge Lux Bux America bullied its way past several RVs ahead of us as we bypassed the Black Mesa mine and Navajo National Monument. 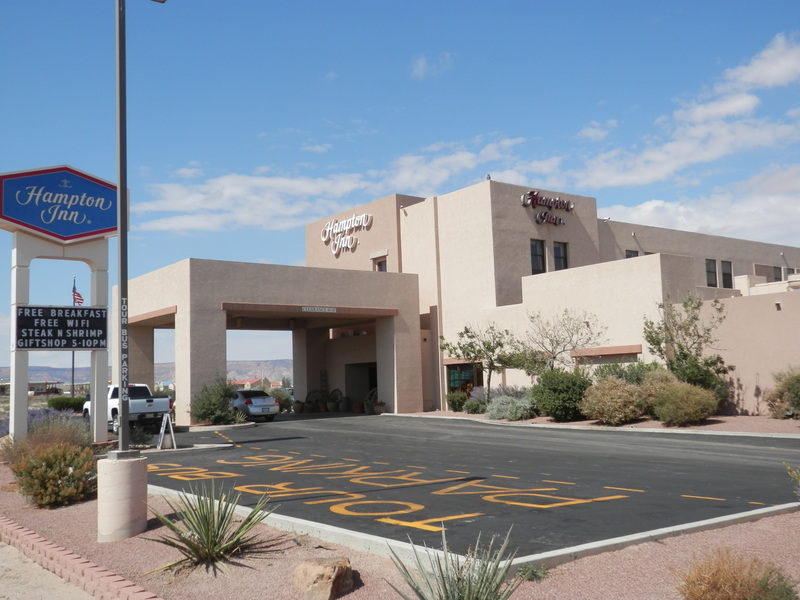 Our overnight stop, the Hampton Inn at Kayenta, was 24 miles south west of the tribal park and directly on the route. We reached it shortly after midday, and as it was three and a half hours before our booked tour, we called in to check whether our room might be ready. 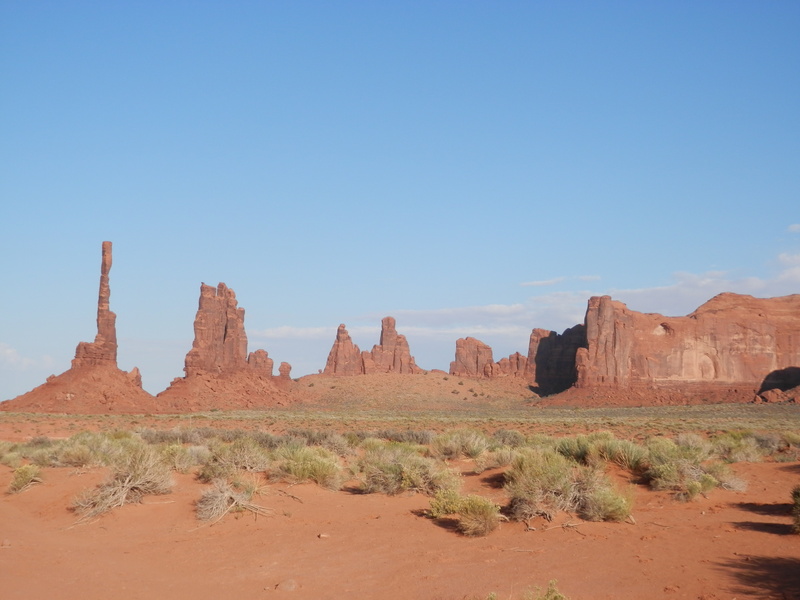 After a half hour wait, during which we availed ourselves of the complimentary tea and coffee, we placed our luggage in the room and set off for Monument Valley. Careful to avoid the cattle and horses grazing by the roadside, we took US-163, one of dozens of ramrod straight roads on this trip, joining a steady procession of tourist buses and Cruise America RVs intent on witnessing the archetypal western landscape. Low rise homes of brick and wood mingled with churches, including the Living Word Assembly of God and Jehovah’s Witnesses, and health, recreation and animal care centres before the scenery took on the familiar look of desert, sagebrush and isolated, thrusting buttes. The mood in the car of approaching awe and solemnity was briefly shattered as a sign proclaimed that the highway had been adopted by “the family of Jimmy Krank” (this reference will sadly be lost on my American readers). We entered Tsi-Bii-Ndzisgali, the Navajo for Monument Valley Navajo Tribal Park meaning “the valley within the rock” ,with an hour and a half to spare. Although we were hungry we were more desperate for our first live view of that most iconic of movie locations. We may have seen it a hundred times on screen but nothing can prepare you for encountering it laid out before your eyes for the first time. And there it was! The official leaflet proclaims it the “8th wonder of the world”. Those that have seen both compare it with the Pyramids at Giza, and the majority declare that it surpasses its Egyptian counterpart. I am content to take their word for that. Surely Wordsworth was stood here rather than gazing at Westminster Bridge when he declared “earth could not pass by a sight so touching in its majesty”. Curiosity sated, our attention turned to lunch. Built less than four years ago in a style and colour sympathetic to its age old neighbours, the View Hotel provides luxury accommodation and stunning views. 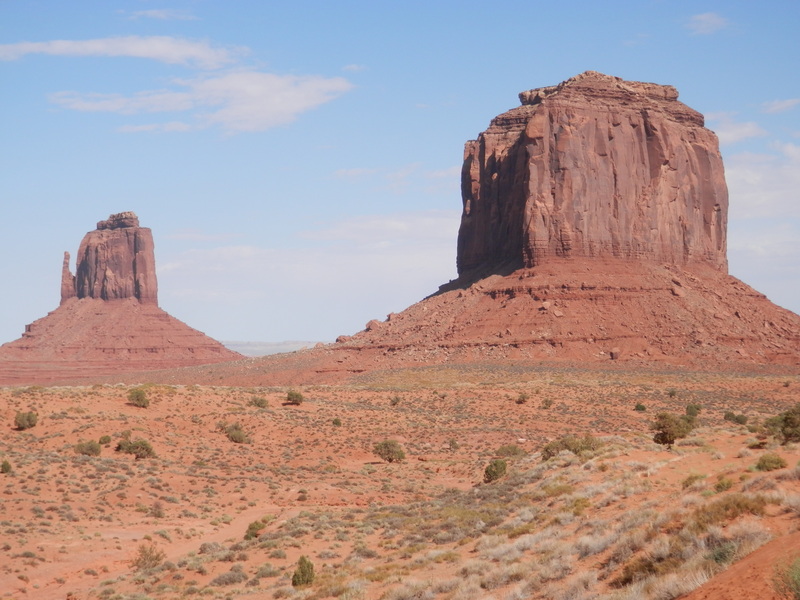 We found a table by the picture window overlooking the East and West Mittens and Merrick Butte, John Wayne’s favourite view, and ordered Navajo Tacos, fry bread with ground beef, pinto beans, onion and lashings of lettuce and cheese. Janet had the good sense to ask for the small plate whilst I succumbed to gluttony and had the large version, to the amusement I recall of the server, a decision I almost came to regret on the helter-skelter jeep ride in the backcountry later in the afternoon. We assembled in the foyer of the hotel to await our guide. As the appointed time approached it appeared that we might be the only people on the tour. However, we were joined by another British couple and a mother and son from New York. Larson, from Navajo Spirit Tours, appeared shortly afterwards to advise us that our guide, Miesha, was running a few minutes late and engage us in some ice breaking conversation. Once Miesha had arrived and introduced herself, she drove us to the traditional hogan village, a group of sun-baked mud covered homes, built in harmony with the universe and all living creatures on earth. The large one in the picture, a female hogan, is used as a permanent home, and represents love, peace and kindness, whereas the smaller, conical version, the male hogan, is the location for ceremonies and for war plans to be drawn up (though not for some time I hope). Aside from their spiritual significance, they perform another valuable function in that they retain heat for long hours in the winter and can be 25% cooler than the outside temperature in the summer. Our next stop gave us close up views, or as close up as visitors are, rightly, allowed to be, of the classic triumvirate of the East and West Mitten Buttes and Merrick Butte as well as satisfying any retail urge we might have retained with a dozen or more tables displaying Navajo rings, necklaces, earrings and bracelets. With the notable exception of the aforementioned, the most famous viewing spot in the valley is John Ford’s Point, the place where the great movie director, whose catalogue includes Stagecoach, She Wore A Yellow Ribbon and The Searchers, would spend hours contemplating his life and work. More stalls and a caravan selling fry bread and cold drinks completed the scene. 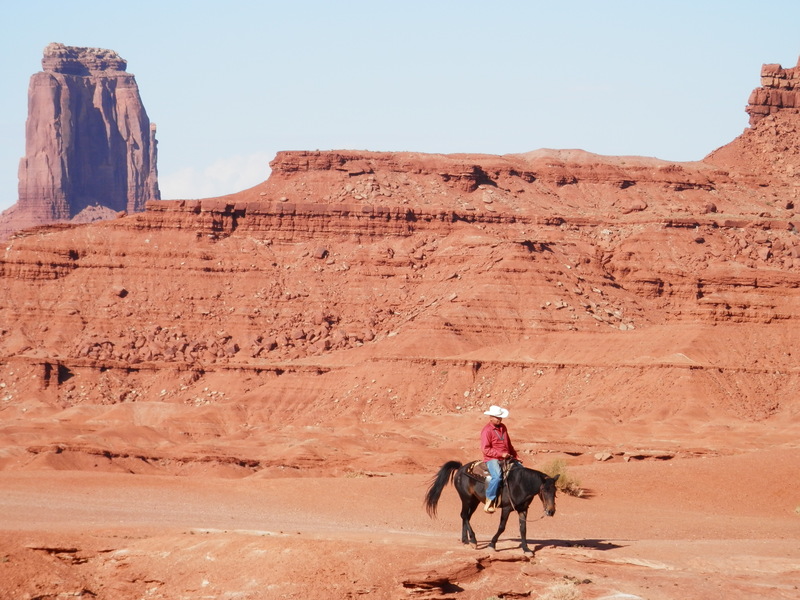 The lone cowboy in the photo above appears periodically to enable visitors to satisfy their fantasy still further. The selling point for this particular tour had been the excursion into the restricted areas of the valley. The self-drive and basic tour options focused purely on the more familiar areas. We were heading into the back country! 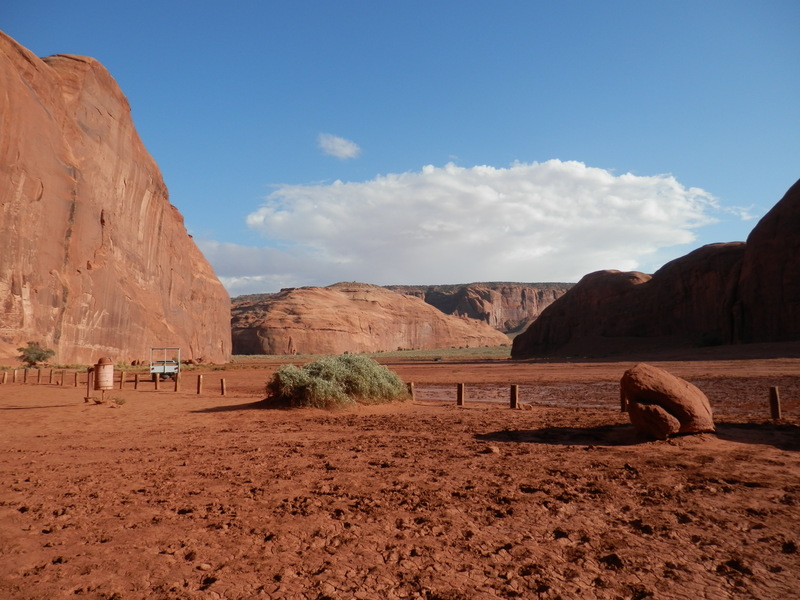 Shortly after leaving John Ford’s Point we turned off the well trodden road down a narrow path out into the area bounded by the Rain God, Thunderbird and Spearhead Mesas. 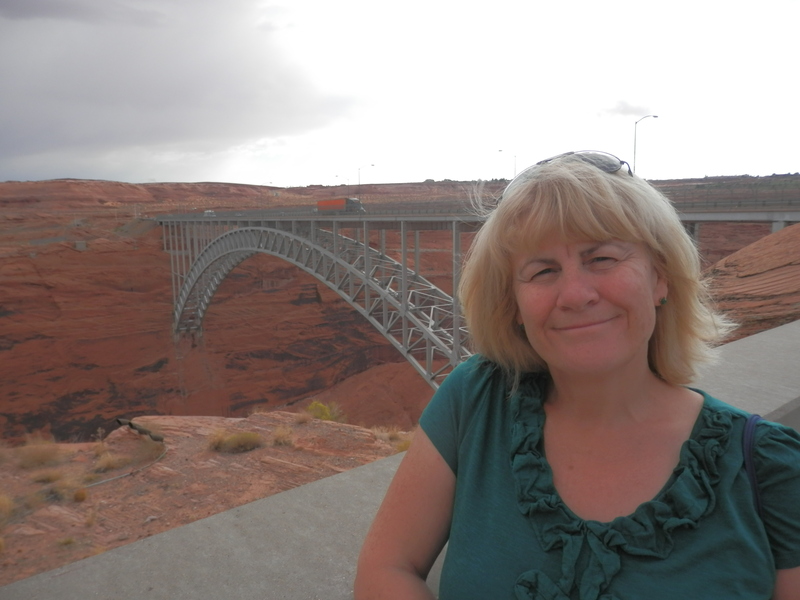 The journey was reminiscent of the previous day’s bone-breaking ride to Antelope Canyon as Miesha made the jeep lurch in and out of the dry, rutted terrain. But she delivered us into a quiet, magical expanse that seemed far removed, even from the vistas we had marveled at only a few minutes before. Here we encountered wild horses, a small party on horseback on a day’s trail, spectacular rock formations and sporadic lush vegetation – and, above all, blissful peace. We were afforded the opportunity to see close up some of the most celebrated, but less often seen, sights of the valley, including the Totem Pole and Suns Eye (both pictured below). 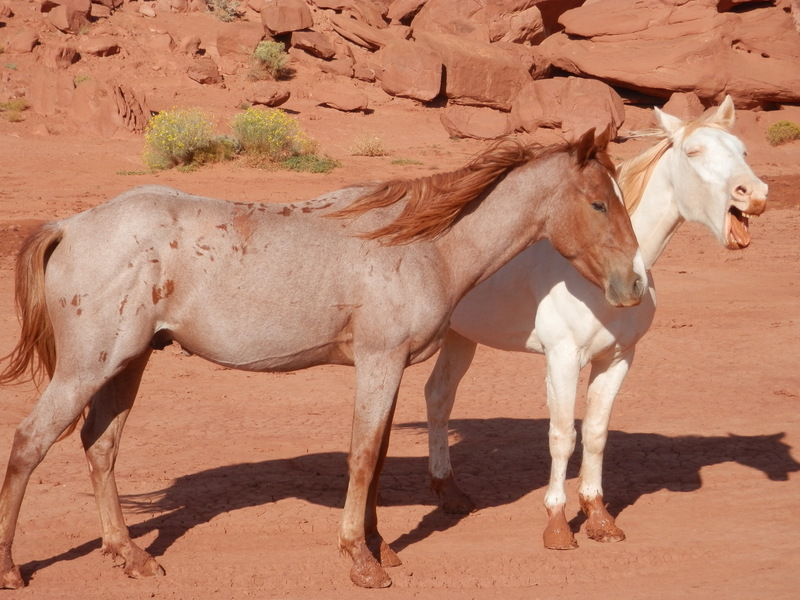 It is perhaps at this point that I should say a little more about the Navajo in general, and Miesha in particular. Much of the appeal for me of this road trip had been the opportunity to witness both the landscape and culture of the native american, primarily Navajo, people first hand. But everything I had read in preparation cautioned the visitor on how to interact with them. I was a guest in their land, an impoverished one in many respects. My hosts held deep spiritual beliefs that were far from the mainstream of American life. Some individuals might be difficult, taciturn, even hostile. It was essential, therefore, to interact with respect and humility – which I hoped I would have done without the friendly warning. 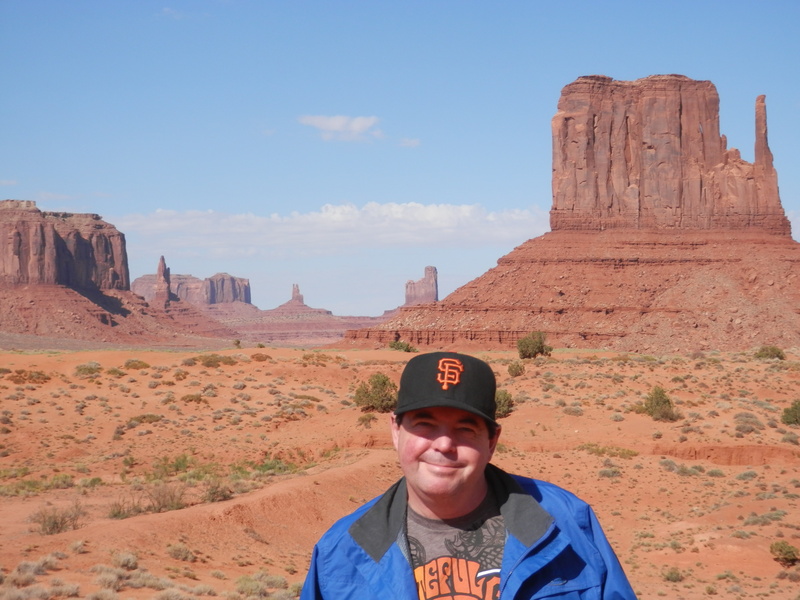 I can only say that I did not have a single conversation or transaction with a Navajo throughout the trip that was not friendly and respectful. Our guide in Antelope Canyon, Rosie, could not have been more helpful or informative. Every restaurant server, trading post or stall owner greeted us with a smile and showed an interest in where we came from and what we were doing in their country and were grateful that we were. Of course, they were aiming to part us from our money at the same time, but that never seemed the primary motivation. Not only are their beliefs about nature and man’s duty towards it, highly attractive, and ones that western man had largely forgotten, but on an individual basis they were a joy to deal with, on this day and the coming days wherever we went. When we first met her, and were about to board her jeep, she outlined the three hour tour we were about to embark upon. Ever smiling, quietly spoken, a little diffident perhaps with a girlish giggle at the end of most sentences, she was nonetheless authoritative and immediately gained my confidence. Not only did she recount the history, myths and, of course, movie relevance, of each sight in the valley, but she regaled us too with stories about her life and that of her family, bringing out the basic principles of the Navajo way of life such as respect for nature, balance in all things, and one that struck me as so contrary to our British and American prejudices – reverence for the wisdom of old age (her grandmother was 99). Everything she said reinforced her commitment to these principles. A modern 21 year old woman but one deeply rooted in the Navajo life. Hugely talented, she had traveled far with her flute playing and singing. Indeed, her rendition of two songs, one in Navajo and the other in English, whilst her small tour party lay on their backs looking up through Suns Eye, was the most affecting moment of the whole trip for me. She even made a vain attempt to teach us some Navajo! 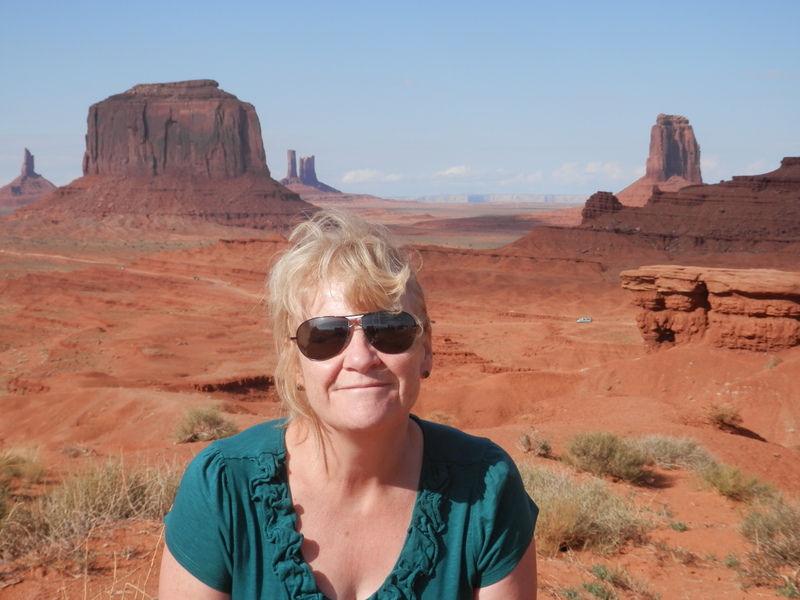 I think Janet and I did get top marks as we did already know Diné (the people)!